Is Mexico City Safe for Tourists? The Le Meridien Mexico City is relatively brand new and just opened last year after a major conversion from an Hilton Embassy Suites hotel. 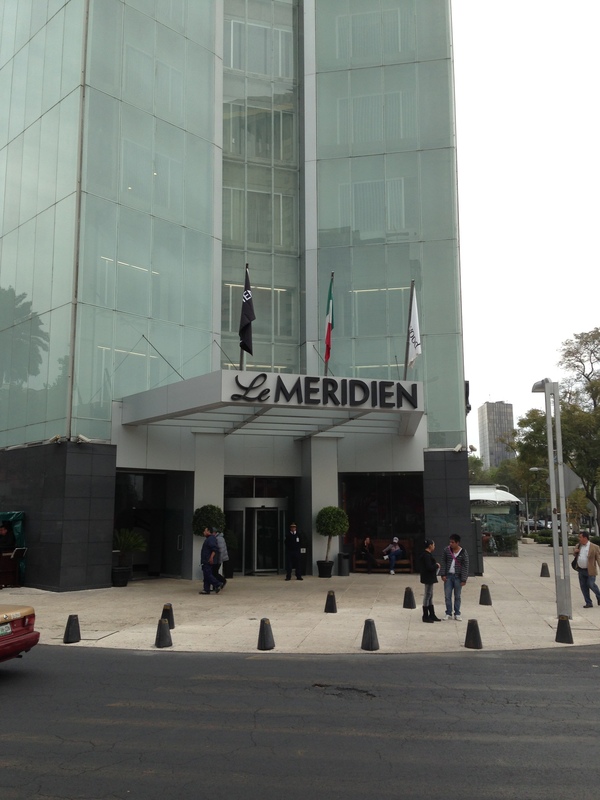 Most taxi drivers still don’t know how to get to the Le Meridien Mexico City, so be sure to have the address “Paseo de La Reforma 69” or refer the hotel as the Embassy Suites. I try to avoid taxis as much as possible since they are a complete ripoff and I often choose hotel locations where many of the local sights can be found within walking distance and close by a metro subway/light rail station. 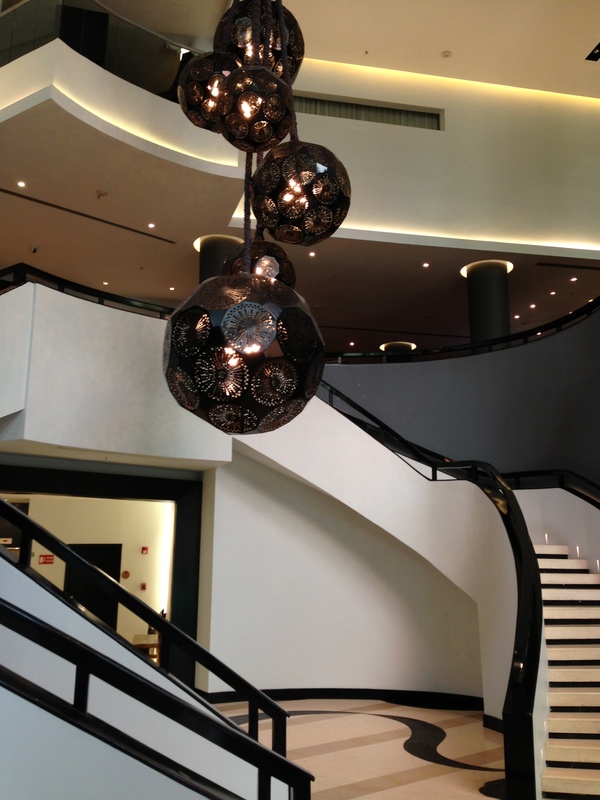 As I approached the Le Meridien, I was greeted with a grand modern lobby that had large shining balls hanging from the ceiling. I was advised the front desk check-in area would be one floor above the lobby. 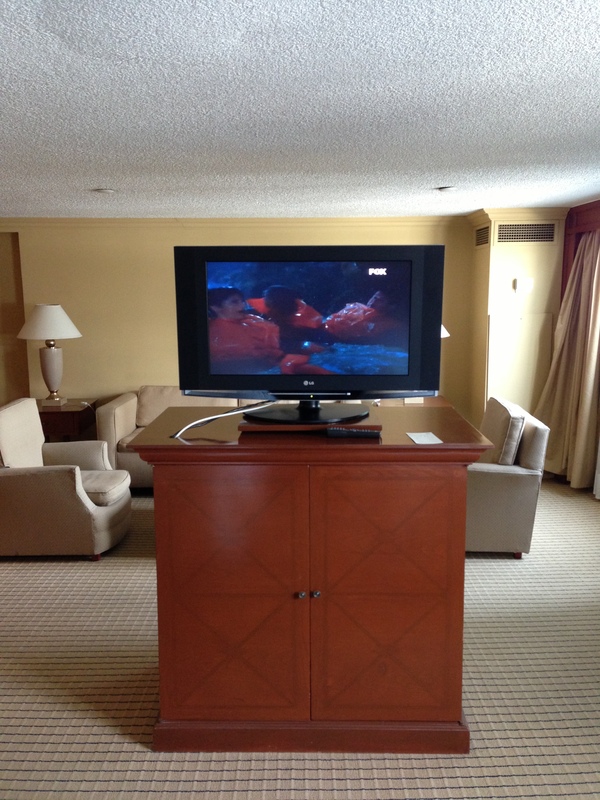 I checked in around 2pm and I was upgraded to a Premier Suite from a Classic Suite, but the room wasn’t ready yet. The hotel only has classic suites, superior suites, and premier suites available so I felt lucky to have scored a 2 room upgrade. Since I had an early flight the morning after, I decided to choose the 500 Starpoints as my Platinum Welcome Amenity instead of breakfast. 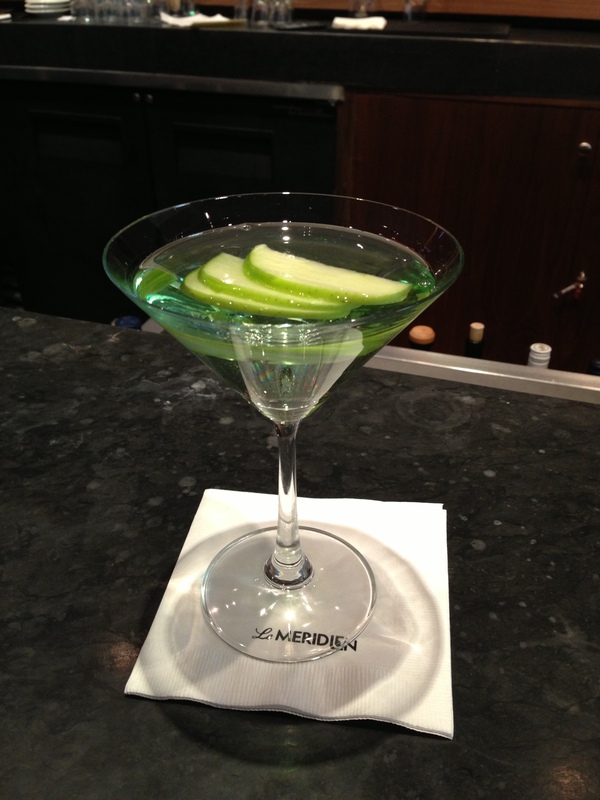 In addition the front desk agent offered me a drink voucher at the nearby bar while I waited for my suite to be ready. 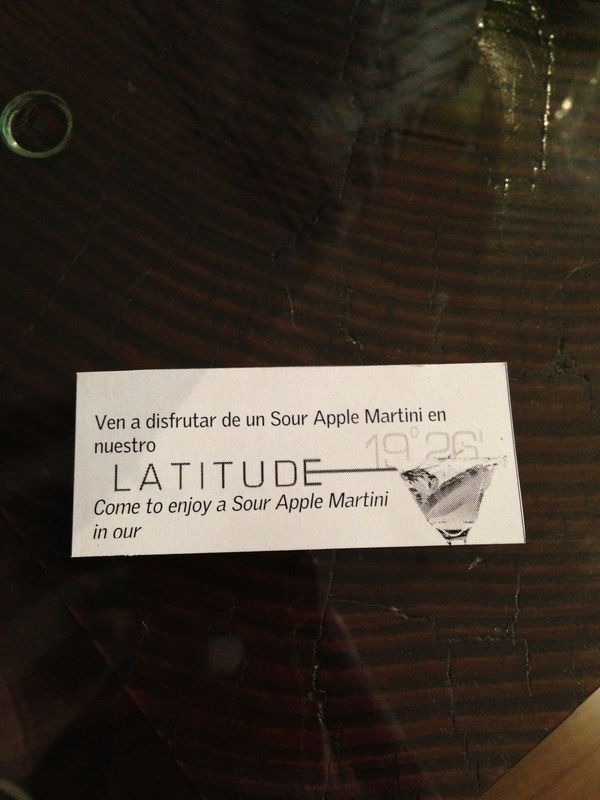 Apparently, you can only use the drink voucher on a Sour Apple Martini, which is one of their signature drinks. As I entered the room, I was welcomed with a large living room area which consisted of a round dining room table that can seat six people. The living room area was huge and the sofa can double as a queen pull out bed as well. 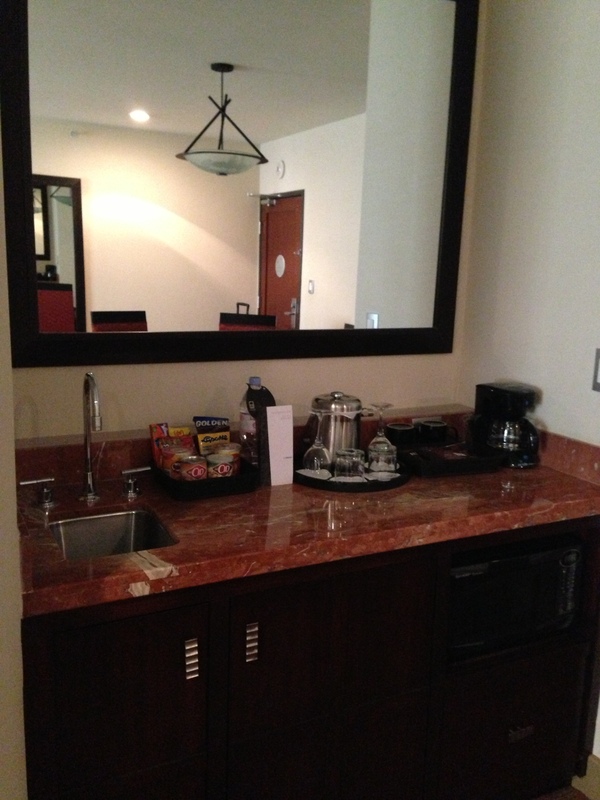 There was a wet-bar, coffee maker, and minibar in the living room area as well. 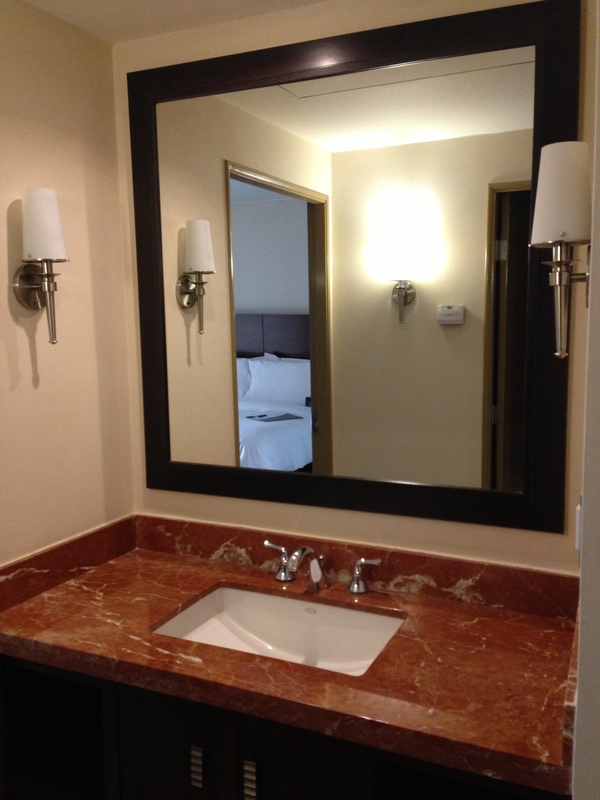 There was a sink and mirror outside the hallway that leads into the bedroom. 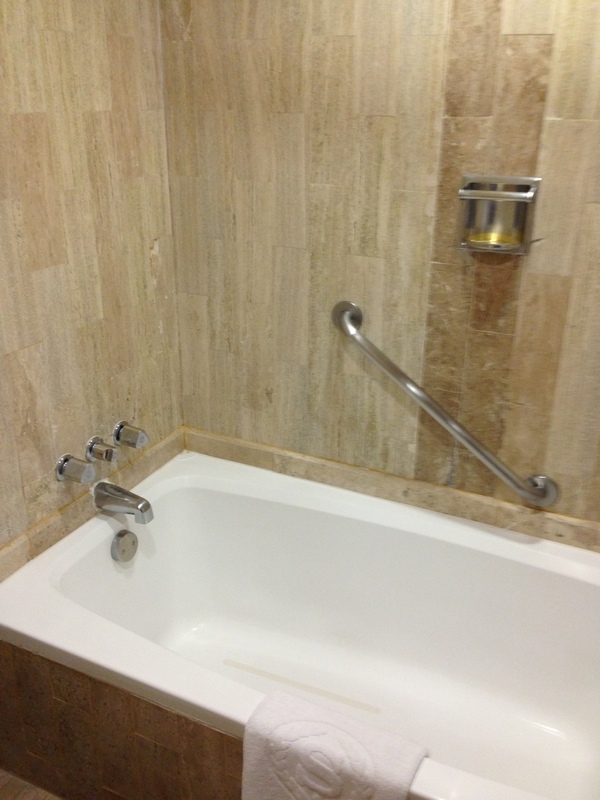 The bathroom contained Le Meridien bath amenities and features a large bathtub with robes and slippers. 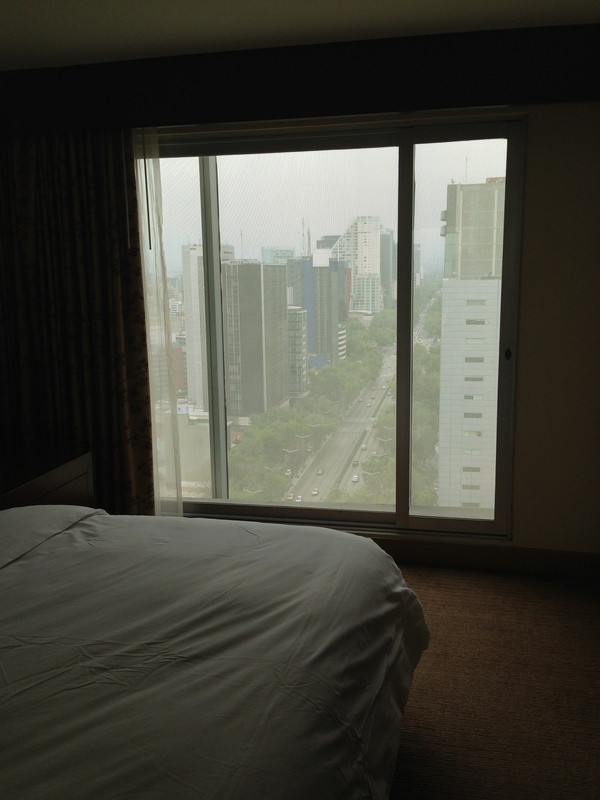 The bedroom area also contained slippers with a large executive work desk and a beautiful view of the famous Paseo de La Reforma street. 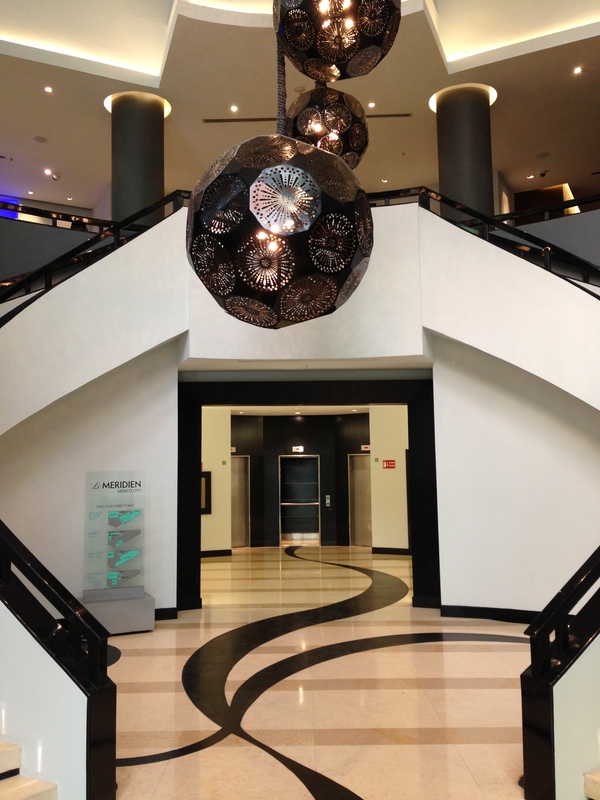 There is so much to do around the Le Meridien Mexico City which is only a 30 minute walk to the Centro Historico or a 30 minute walk the other direction to Zona Rosa. If you like to take taxis, there are plenty of taxi stands around the hotel which can shuttle you anywhere you’d like, but be aware there is an extra surchage at night. During the evening, I found myself taking a taxi to Zona Rosa because I was tired since I was walking all day. I just wanted to relax on my last night in Mexico City and not have to think about walking some more. Overall, I would recommend this hotel if you can get a great deal on cash & points since it’s definitely not worth paying over $200 for this hotel. I would rather stay at the Sheraton Maria Isabel Hotel & Towers since it’s pretty close to a metro and within walking distance to shops and restaurants in Zona Rosa. I recommend this hotel if you wish to hotel hop Starwood properties in Mexico City since it is only a 20 minute walk between properties and if you like to be closer to the Centro Historic district. 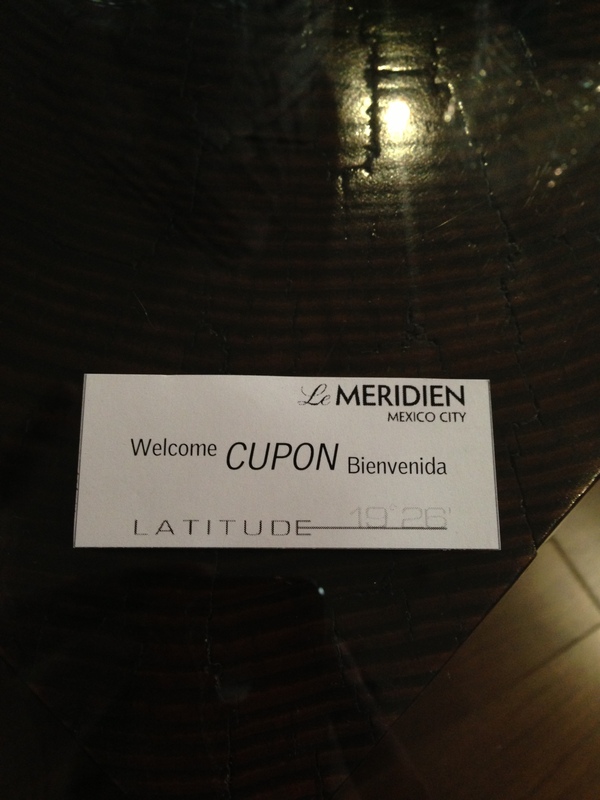 This entry was posted in Mexico, starwood and tagged hotel review, le meridien, mexico, mexico city, starwood, trip report, trip reports on January 31, 2013 by jammanxc. 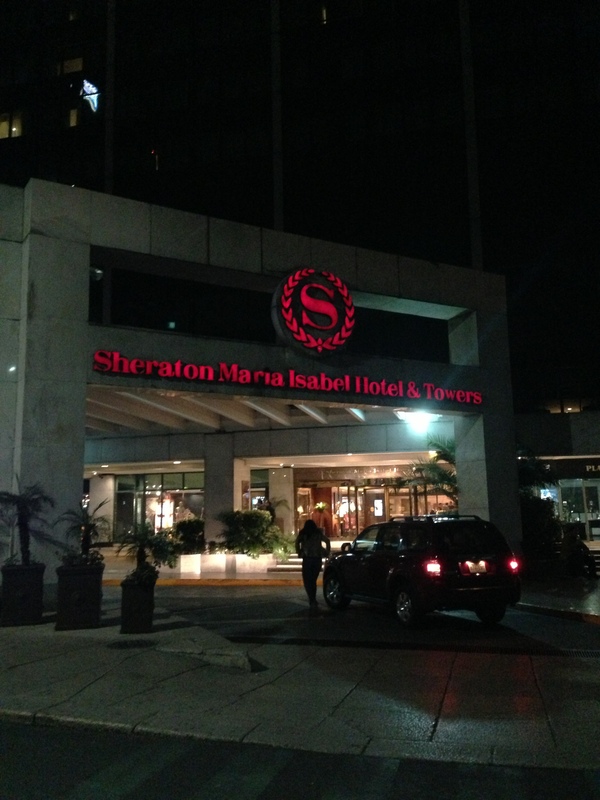 I decided to stay at the Sheraton Maria Isabel Hotel & Towers because it was closer to the Zona Rosa neighborhood which is a touristy destination packed with restaurants, bars, and nightlife. 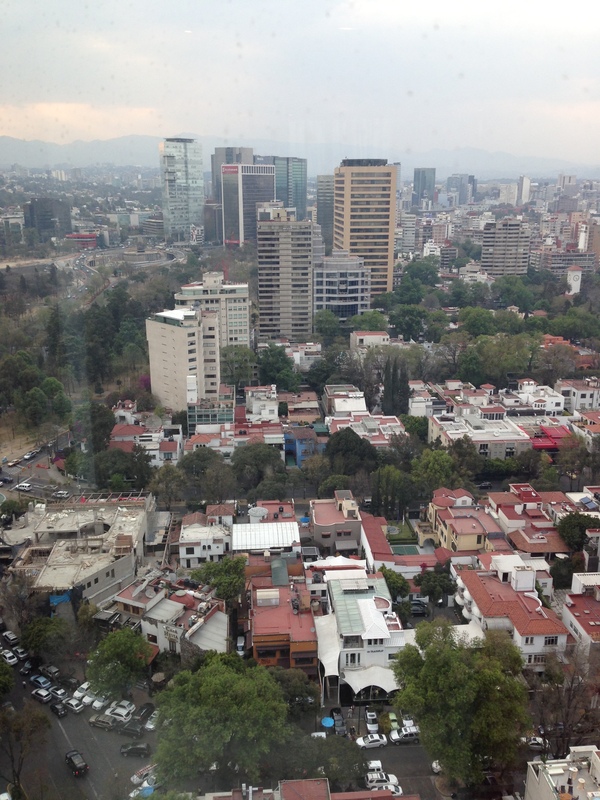 It’s considered the gay area of Mexico City, but there are plenty of straight things to do. I took a regular cab from the W Mexico City to the Sheraton Maria Isabel hotel which was 70 pesos and a 10 minute ride through the famous Avenida Paseo de La Reforma. Beware of taking the hotel cab because the fares are usually 2-3 times more than the regular taxis. I scored an awesome rate of $88+ tax using Starwood’s Best Rate Guarantee and I will have an upcoming post on how to search for those great BRG rates. From the exterior, the hotel looks like any standard Sheraton in North America. 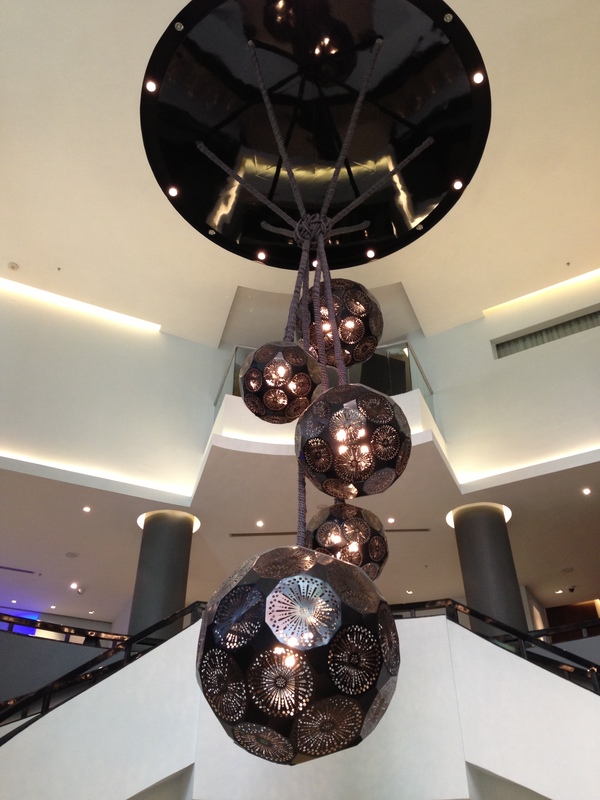 Once you step inside the Sheraton Maria Isabel Hotel and Towers, it feels very ornate and historic. I checked my SPG app prior to checking in and saw that there were many suites available at this hotel. 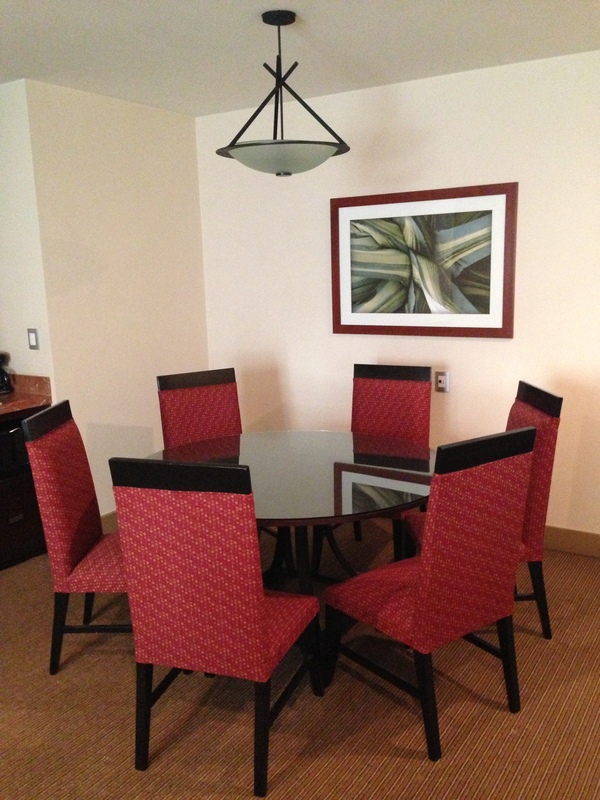 There is a regular room section with suites and also a towers section which also includes suite availability. 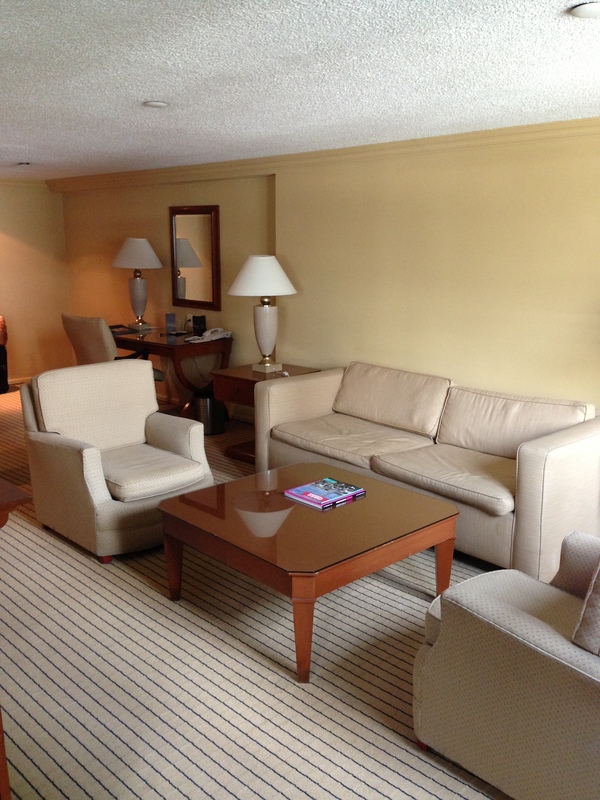 I booked a standard room and inquired at check-in about the possibility of a suite upgrade. The agent said there is a junior suite available, but it has two queen beds. I asked him to check the towers, but he said the tower suites are off limits to the hotel in terms of upgrades. He claimed that the towers section is a whole different part of the hotel and acted like another company ran it. 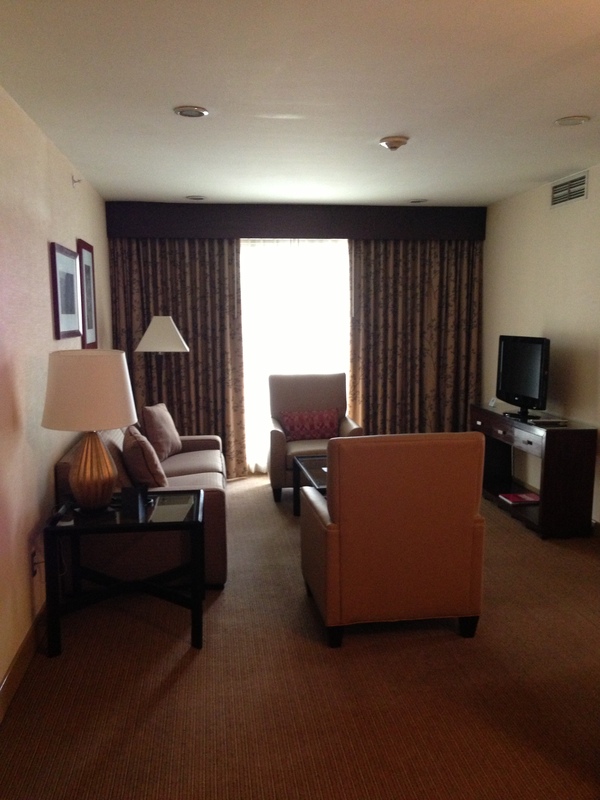 I was happy to have been upgraded to something better than a standard room, so I accepted the junior suite. As a Platinum member, I chose the 500 Starpoints since this hotel has a lounge for evening hors d’oeurves and breakfast in the morning. 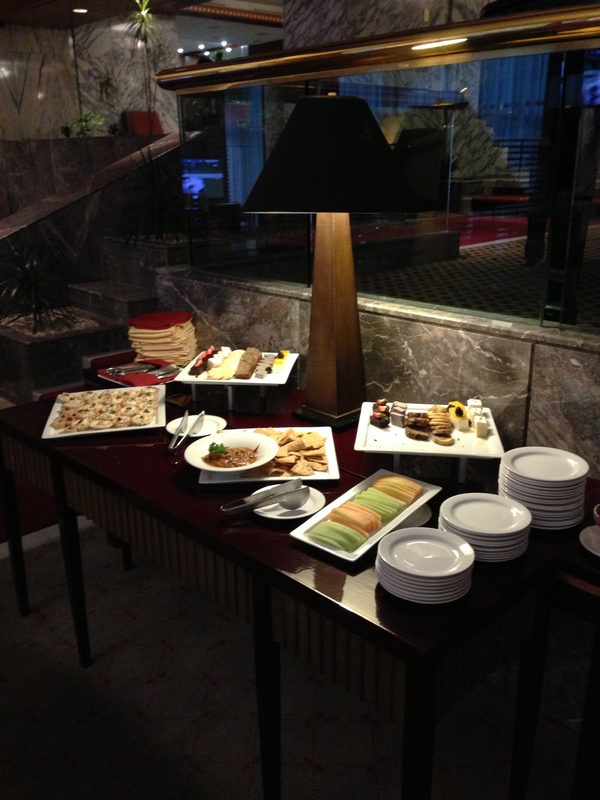 Ironically, the lounge is located in the towers section of the hotel. 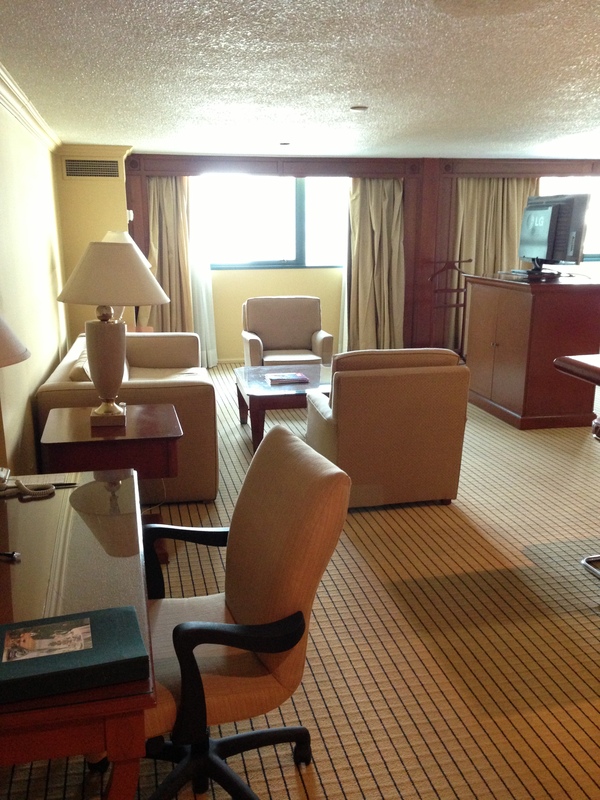 As I entered the room, I was ecstatic on how spacious the junior suite was. 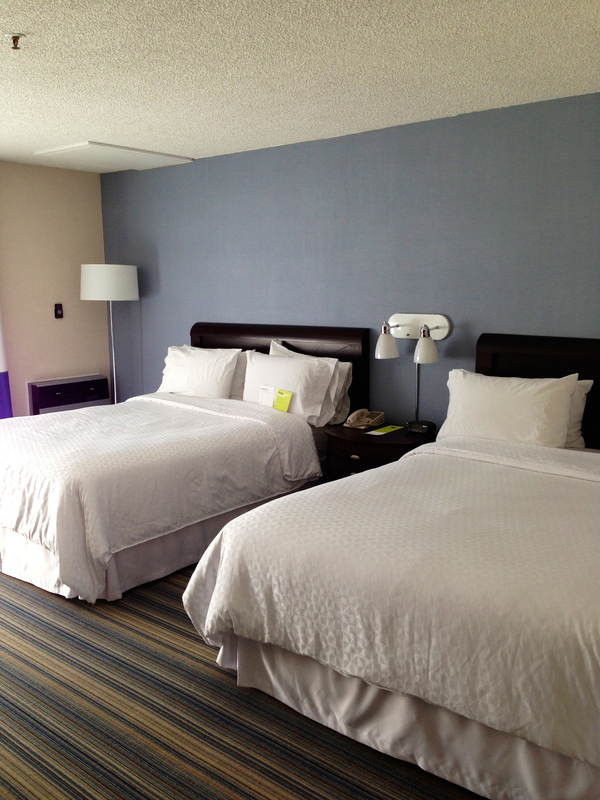 I checked on spg.com and saw that the junior suite with two queen beds is actually larger than the tower suite rooms! There was so much space that you can literally put a dry wall in between the living room and the bedroom TV area and call it a 1 bedroom suite. There is also a breakfast bar area with two chairs. 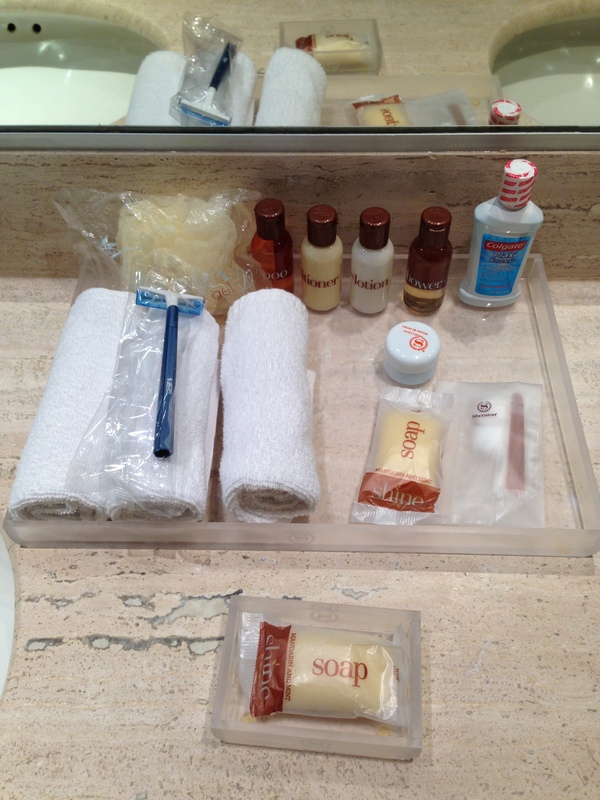 There were a ton of standard Sheraton amenities that can be found in the bathroom area. 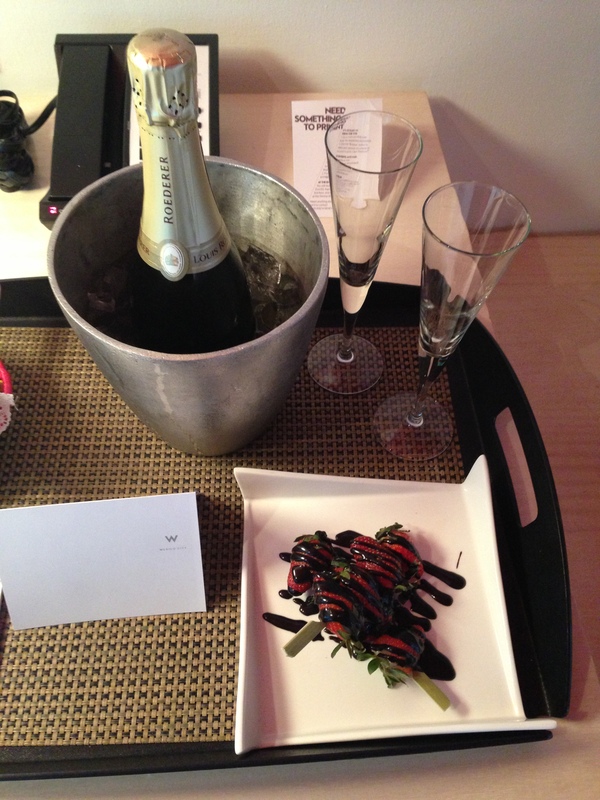 As I settled into the room, I received a phone call from the butler offering me a welcome drink. 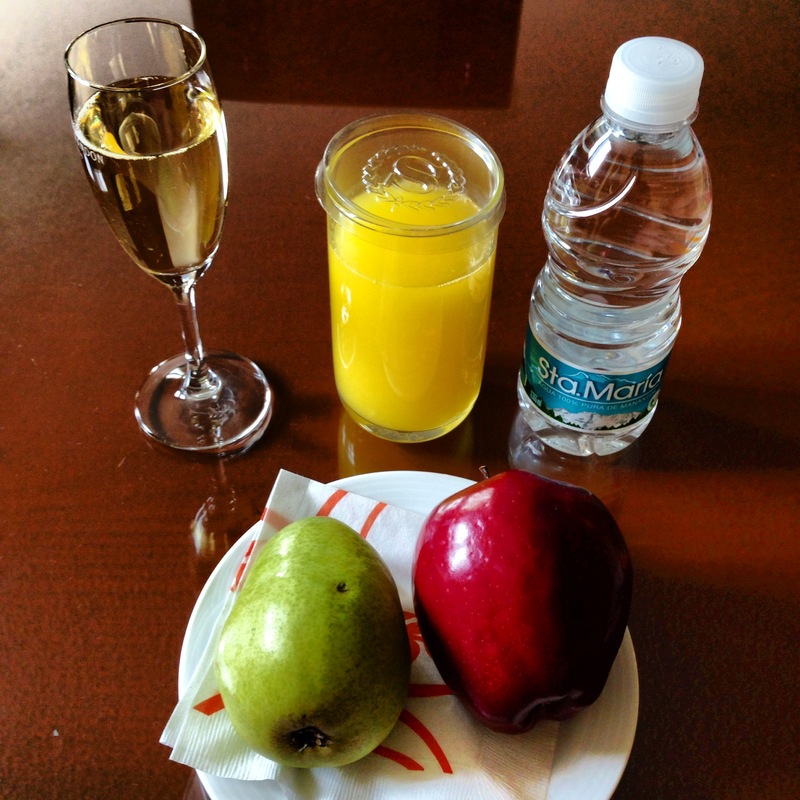 I opted for a mimosa and he brought up fresh fruits, water, champagne, and orange juice. He also asked if I needed anything items of clothing pressed, which I politely declined. I didn’t know I had a butler included in my rate, but that is usually reserved for the towers section of the Sheraton Maria Isabel. 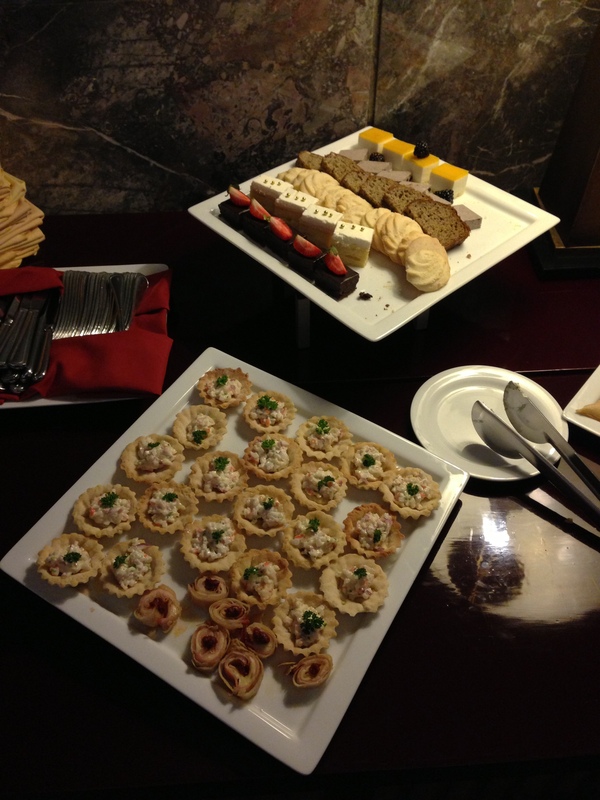 I was advised the hotel lounge for the evening hors d’oeuvers was closed but was moved to the Lobby Bar. 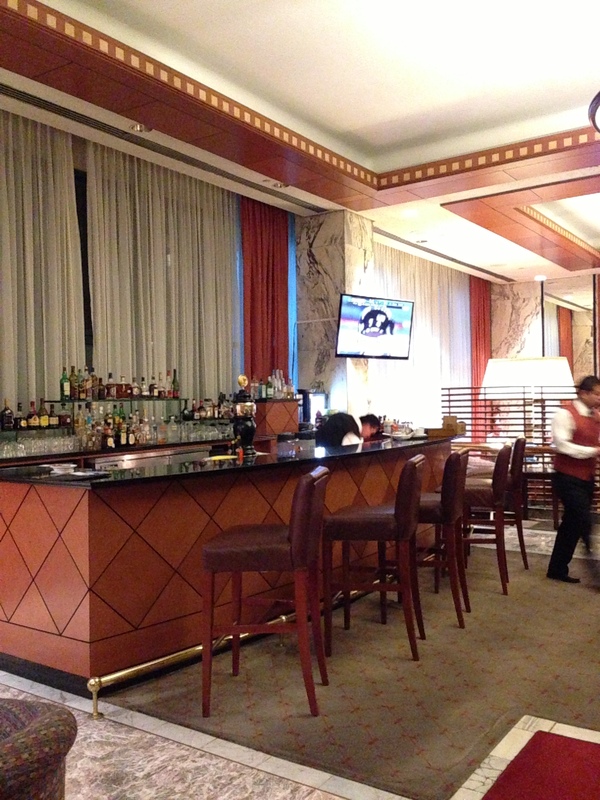 The lobby bar area of the Sheraton is very exquisite. 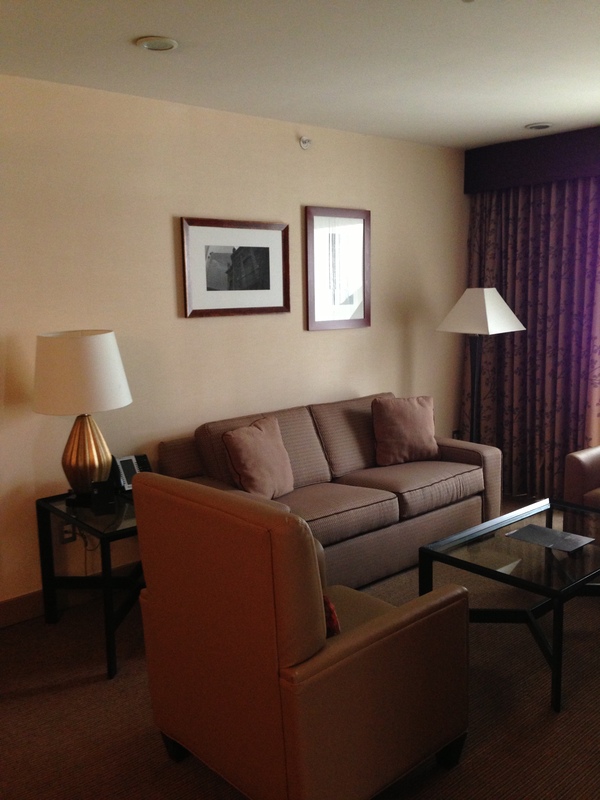 It feels like a W Living Room, but with standard Sheraton furniture. 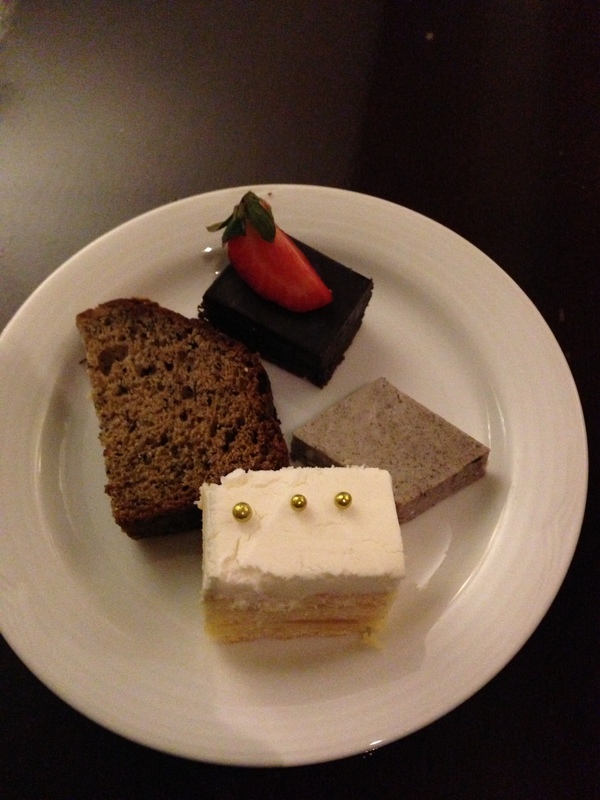 There was a small selection of small bites to choose from including dessert. 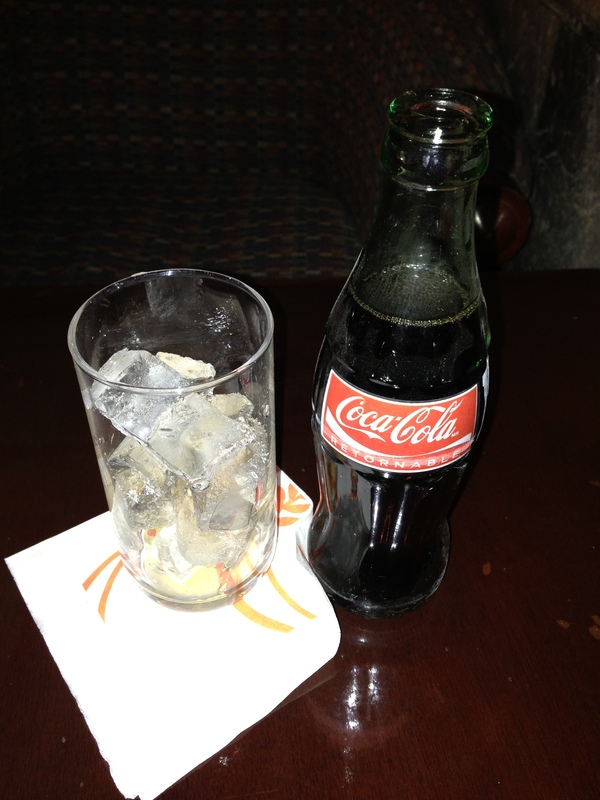 As I sat down, I was approached by a waiter who asked what I would like to drink and I chose a coca-cola. After finishing my light meal, I was handed a bill which was the cost of the small coke. I inquired about this charge and he said it was complimentary, but that I needed to sign for it any way. Needless to say, the charges never ended up on the final bill and I guess they need to take inventory of everything consumed. There is so much to do around the Sheraton Maria Isabel Hotel & Towers! First of all, I always try to avoid taxis if there is nearby public transportation. In this case, there is a close by subway metro stop called Insurgentes. Within walking distance, there are a ton of shopping and restaurants. Across the street and a 4 minute walk from the hotel, you can find the famous Zona Rosa neighborhood where you can find cheap Mexican food and do plenty of shopping. 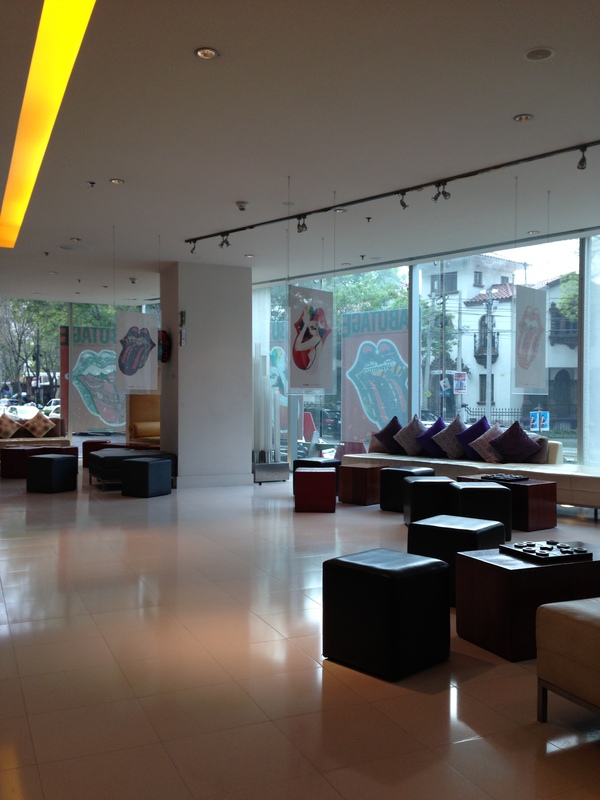 Within a 10 minute walk from the hotel, you can reach a large shopping mall which also has dining called Reforma 222. I felt really safe walking around Mexico City at all times, even during the seedy midnight hours. 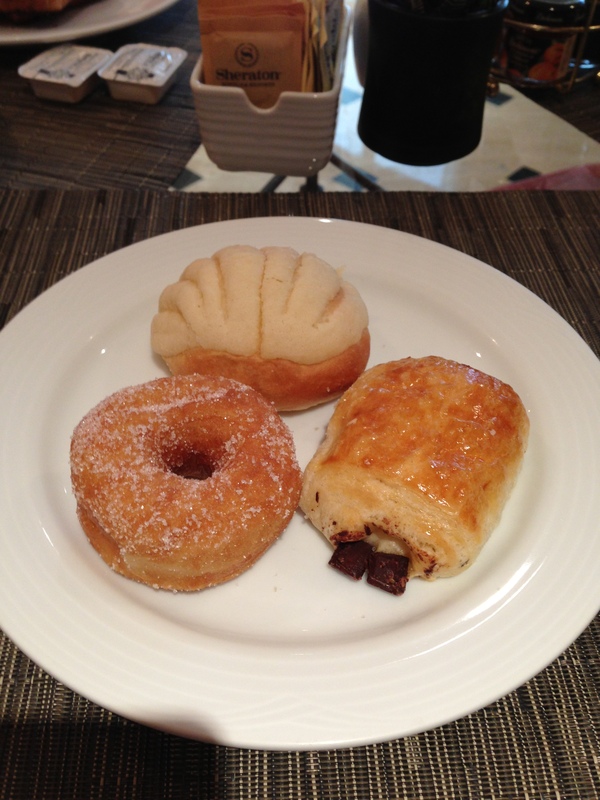 I decided to have breakfast at the lounge which was open on Monday morning. 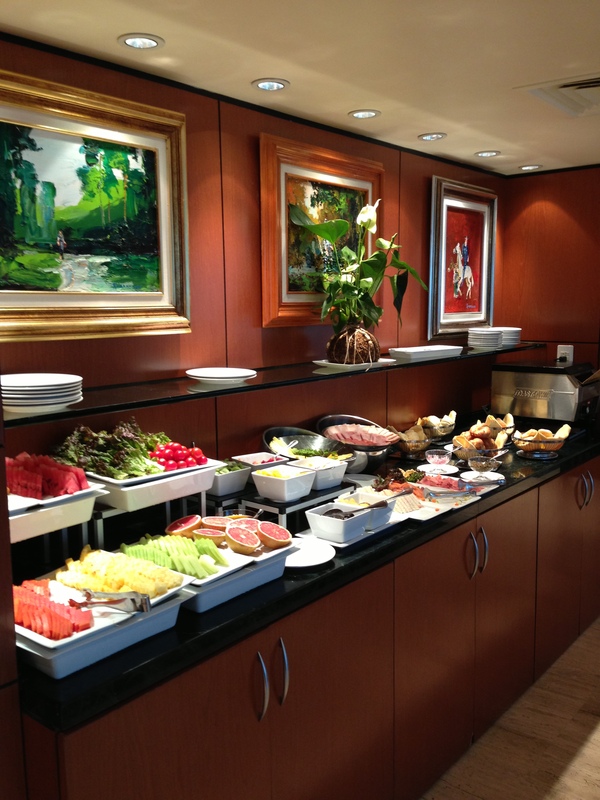 The lounge has an extensive hot and cold breakfast buffet option. 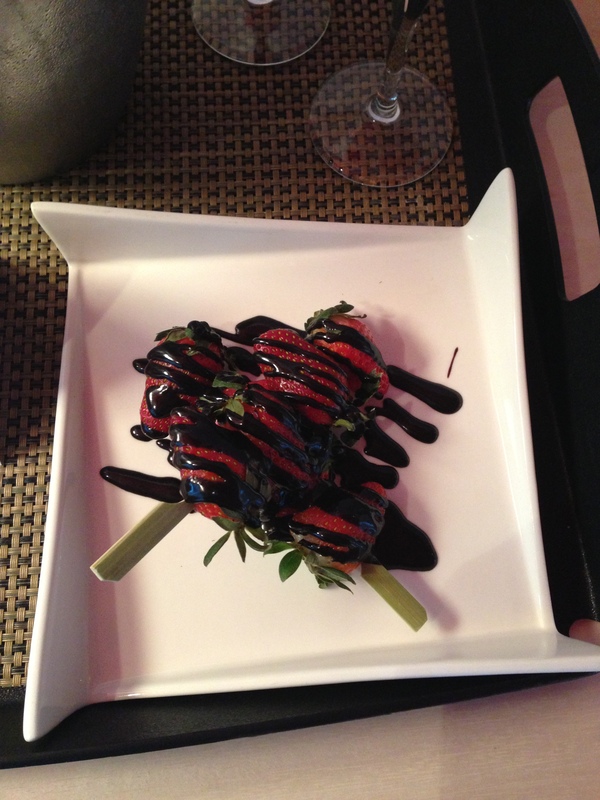 Overall, I delighted with my stay at the Sheraton Maria Isabel. 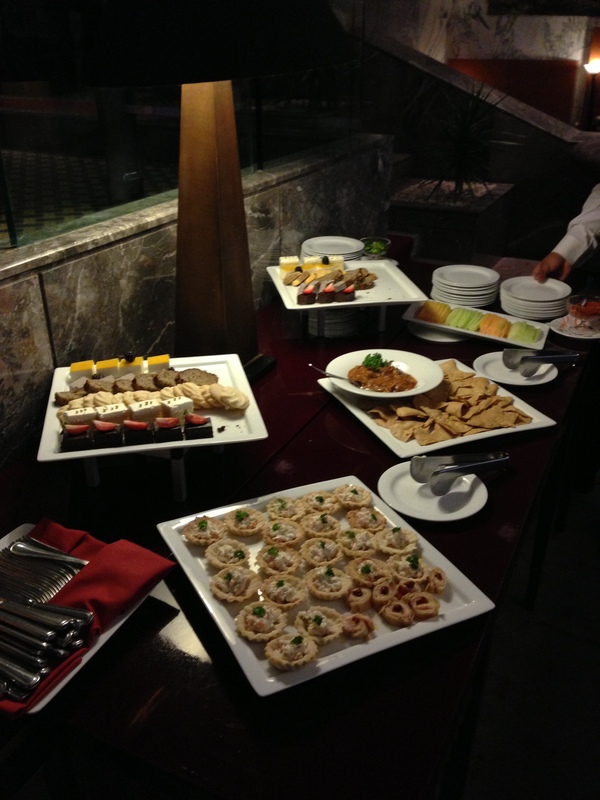 The platinum recognition was excellent and I was constantly greeted by the gracious staff at the Sheraton Maria Isabel. I would definitely make this hotel my first choice the next time I stay in Mexico City since I hardly literally spent more than a quarter on public transportation. 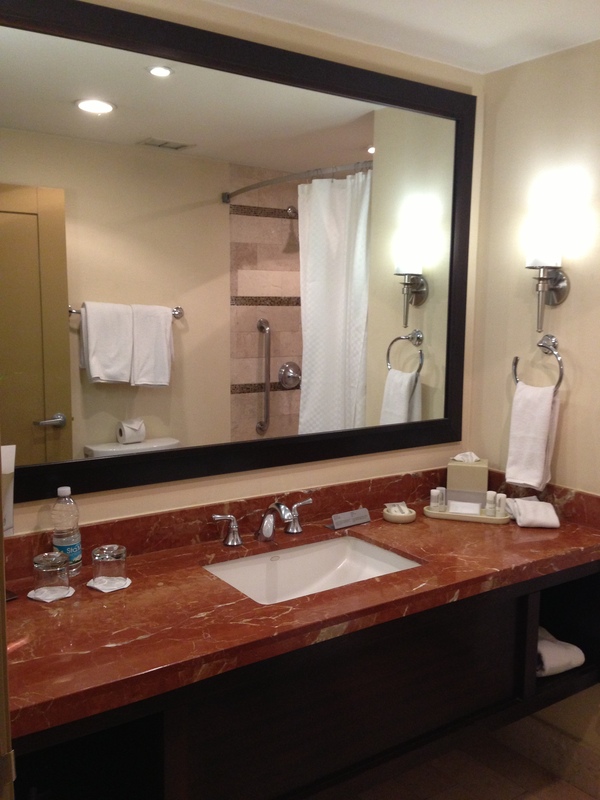 The close by metro also makes the Sheraton Maria Isabel a great choice if you like to sight see. This entry was posted in Mexico, starwood and tagged maria isabel, mexico, mexico city, sheraton, starwood, trip report, trip reports on January 30, 2013 by jammanxc. 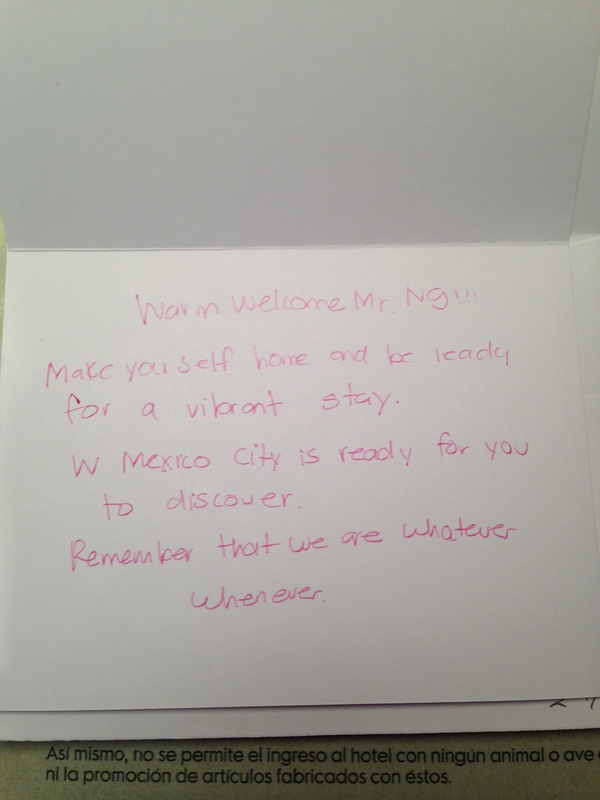 I chose to stay at the W Mexico City because I wanted to stay at the best Starwood hotel in Mexico City. 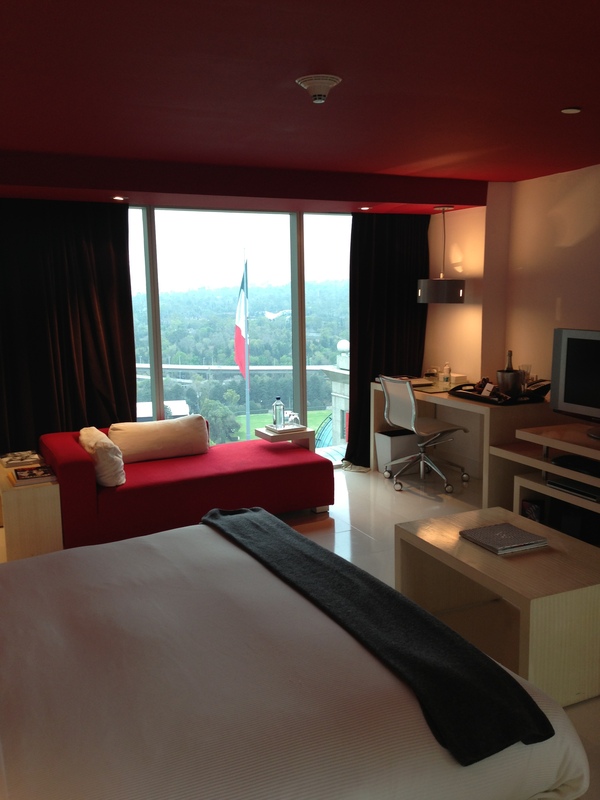 The W Mexico City is located in the Polanco area, which is also known as the Mexican Beverly Hills. 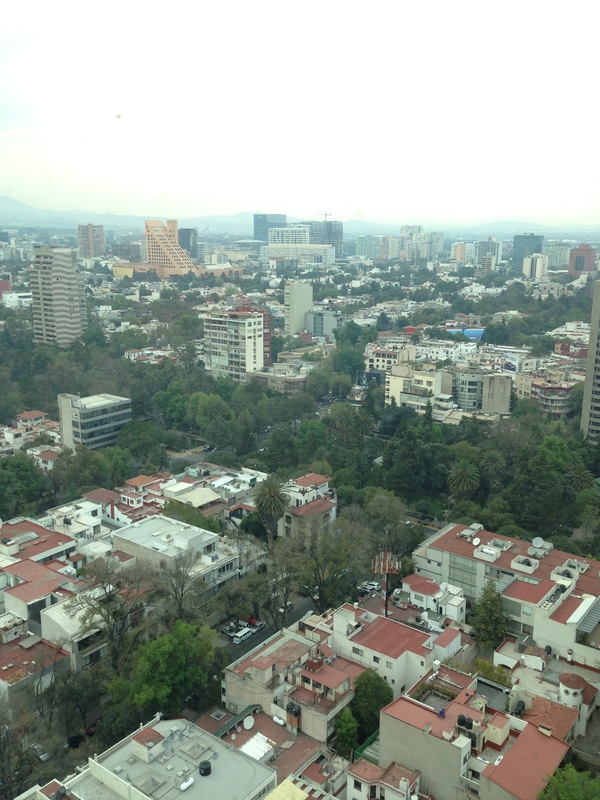 It’s located 25 minutes from the Mexico City Airport and costed $20 USD from a radio taxi company called Sitio 300. 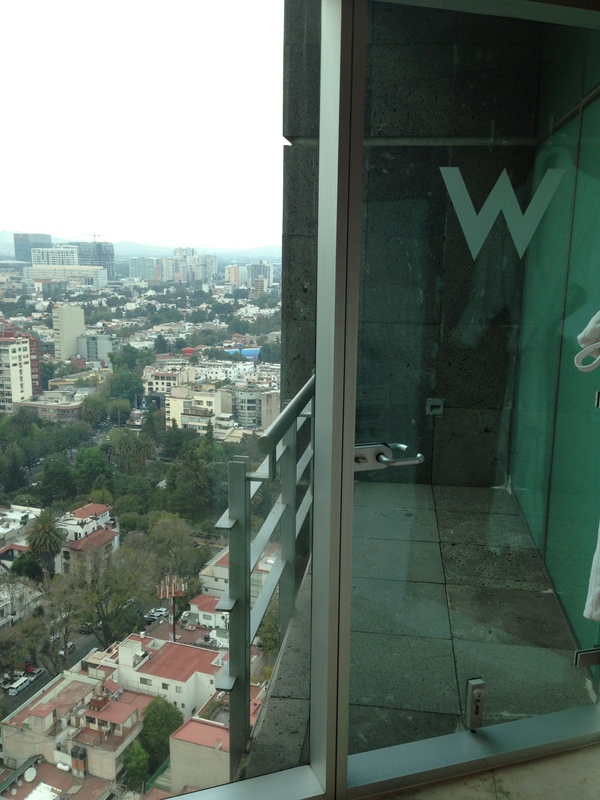 When my taxi pulled up to the W Mexico City, you don’t get a sense that you are in Mexico City. The hotel is situated next to the Intercontinental and Marriott surrounded by nice luxury high rise apartments and condos. 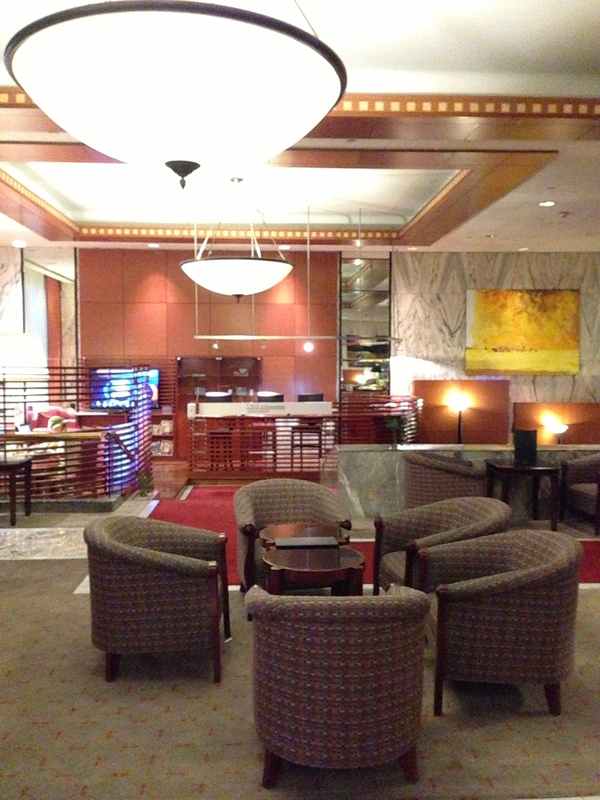 As I entered the lobby area, I was greeted with an spacious lobby with an extensive hotel bar. 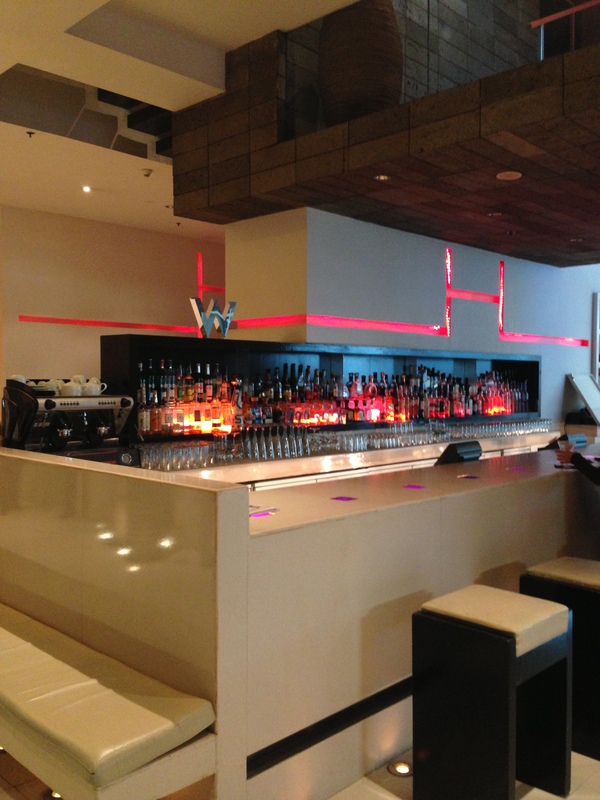 The living room area was right next to the bar which is the signature “W Hotels” hang out spot to mingle and meet your friends or perhaps make new friends. There seemed to be a red theme going on with the hotel which was encountered when you go up through the spiral staircase to the second floor where the restaurants are located. 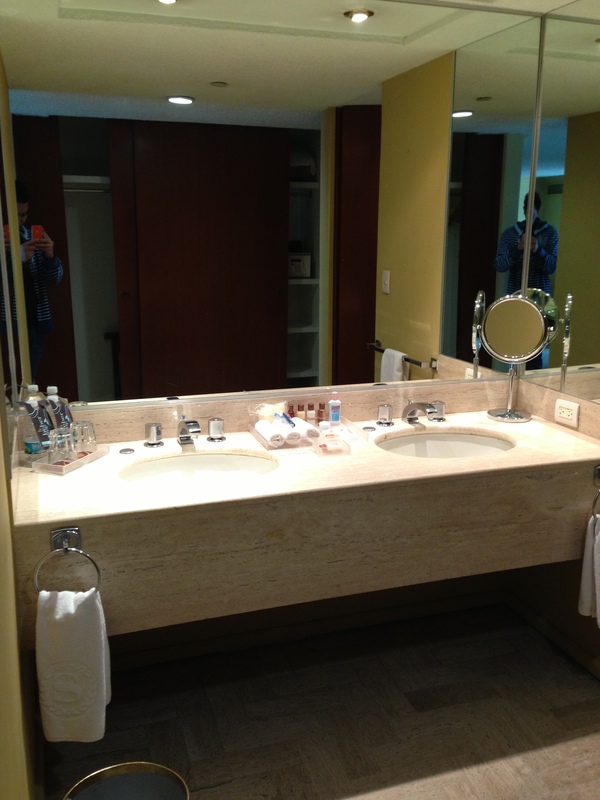 During check-in, I was notified that I had been upgraded to a Fantastic Suite. 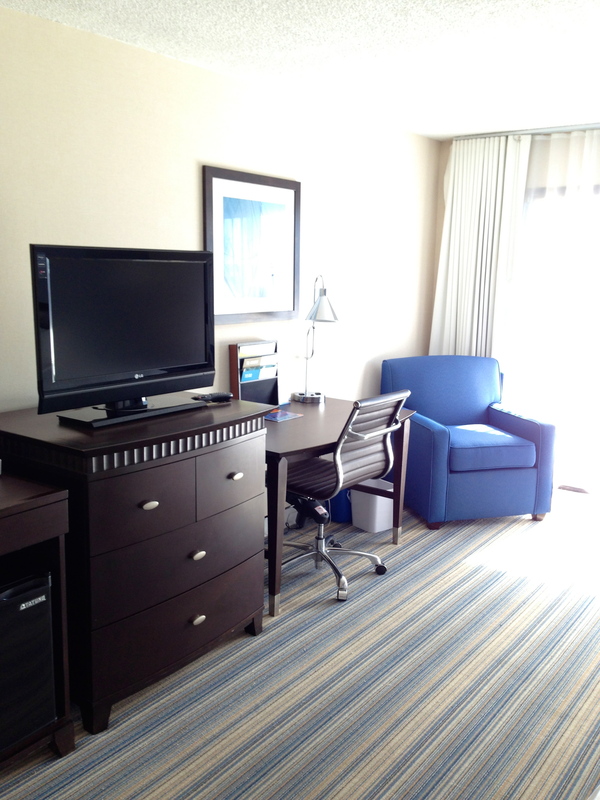 I booked this hotel on a Starwood BRG (Best Rate Guarantee) rate of $171 + tax which was a bargain. Almost all of my Starwood stays are either BRG, 3rd party, AAA, Corp, C+P, and full point redemptions. 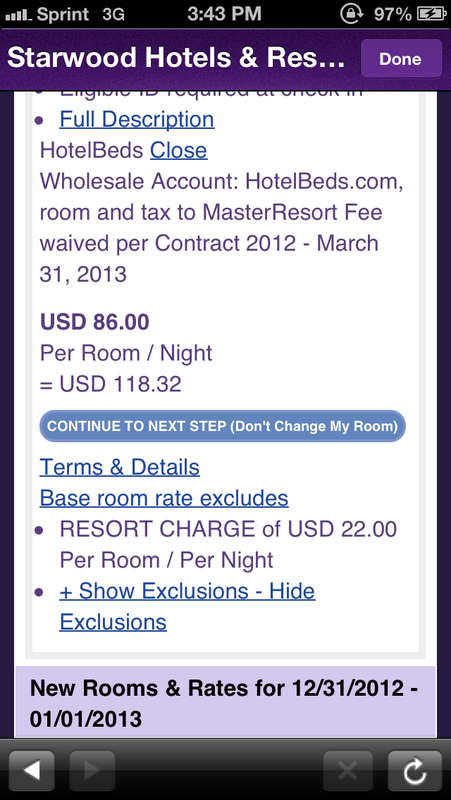 I will show you how I search for Starwood BRG rates in a future post. I was tweeting with @WMexicoCity before my arrival so that could have factored into the suite upgrade along with my Platinum status. I asked the agent what kind of breakfast the hotel offered if I had chose the continental breakfast as my Platinum welcome amenity. She said that it was a continental breakfast buffet in the restaurant and I asked if a buy-up offer was available to the full breakfast buffet with hot items. She said there was no buy up offer so I declined the continental breakfast and chose the 500 Starpoints as my Platinum welcome amenity. She advised me that Internet was free for Platinum guests and that you just charge it to the room which will be taken care of during the time of check-out. 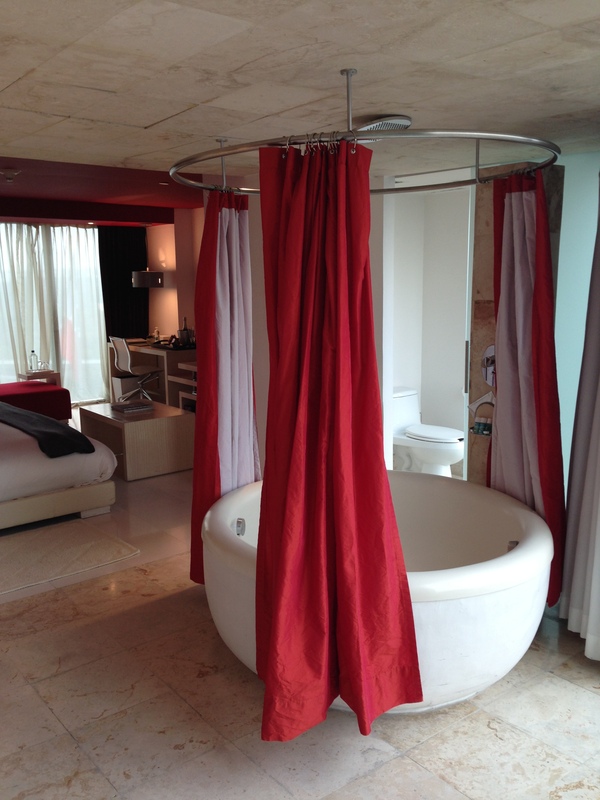 When I arrived to my Fantastic suite, I was jawdropped. 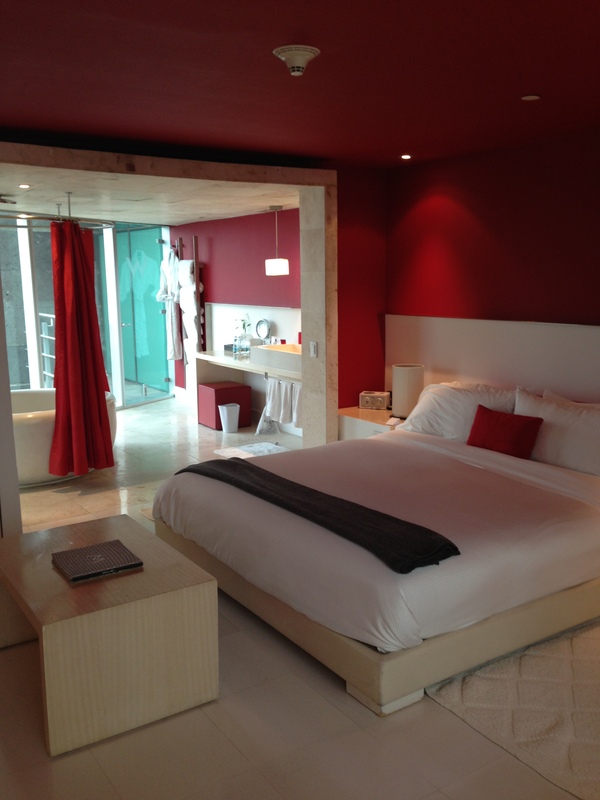 The room looked more amazing in person than in the pictures on the W Mexico City Starwood website. 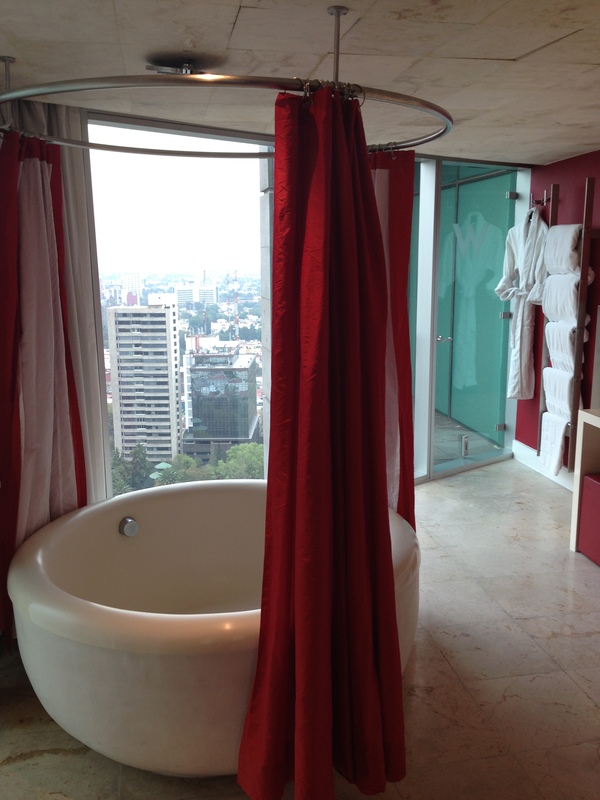 I was floored when I saw the round bathtub with the rainforest showerhead overlooking Mexico City. I made a video tour of my Fantastic suite which can be found below. 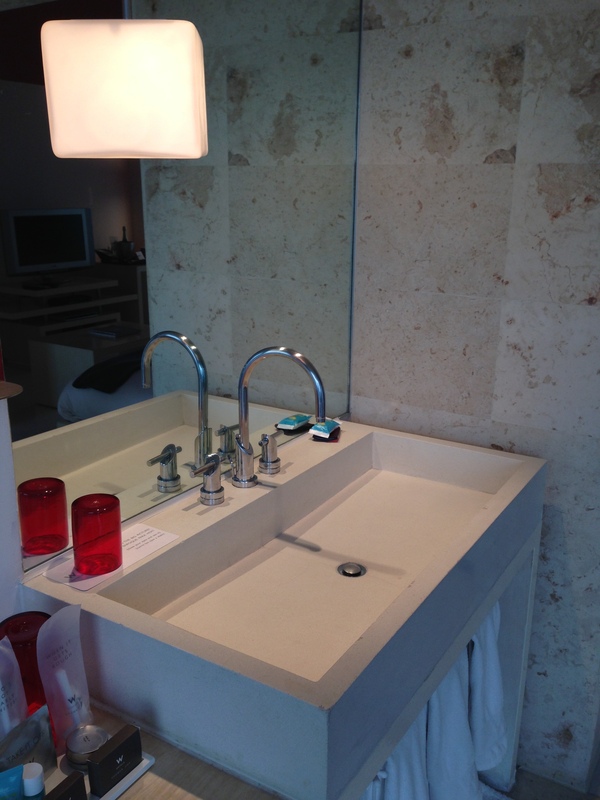 The Fantastic Suite boasted multiple Bliss Spa amenities in the bathtub and sink areas. 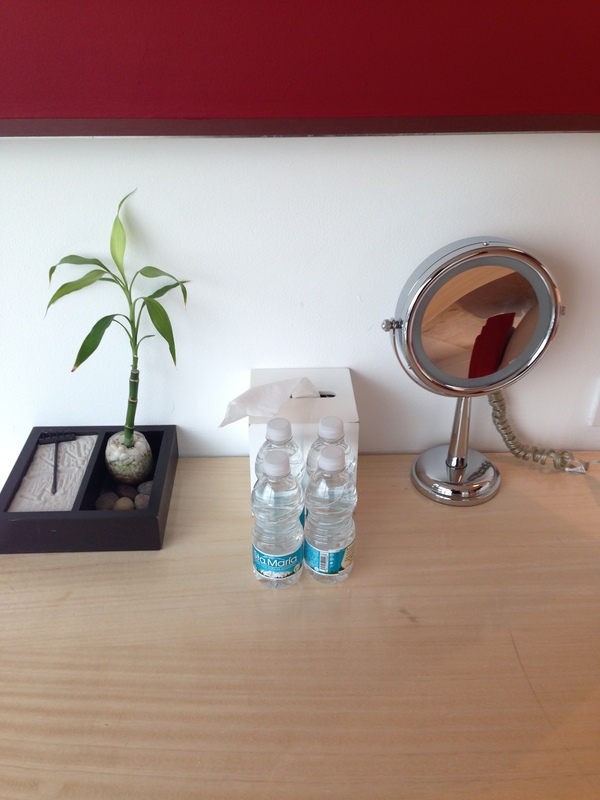 There were also four complimentary bottles of water near the sink area of the bathroom next to the feng shui, plant, and vanity mirror. 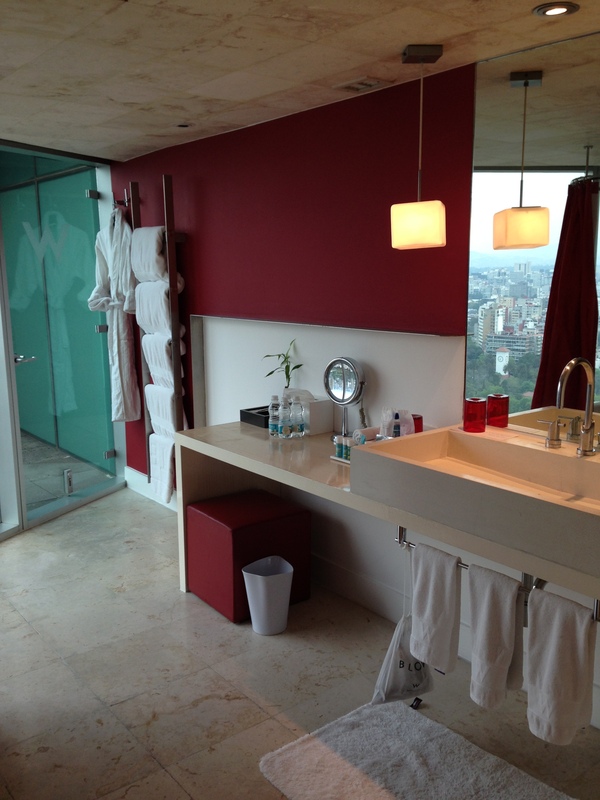 The step-out balcony in the bathroom area has amazing views of Mexico City. 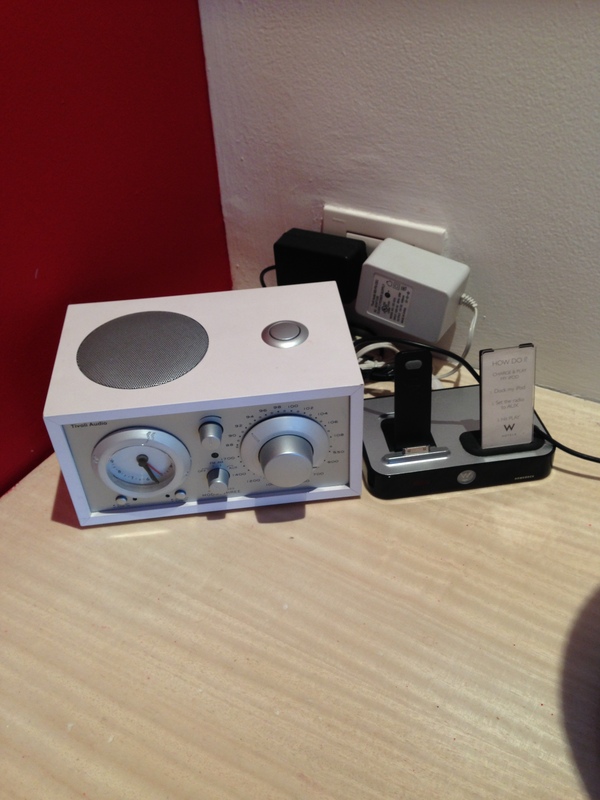 The room also had a iPhone 4/4S dock which you do need to bring your own converter if you have an iPhone 5. 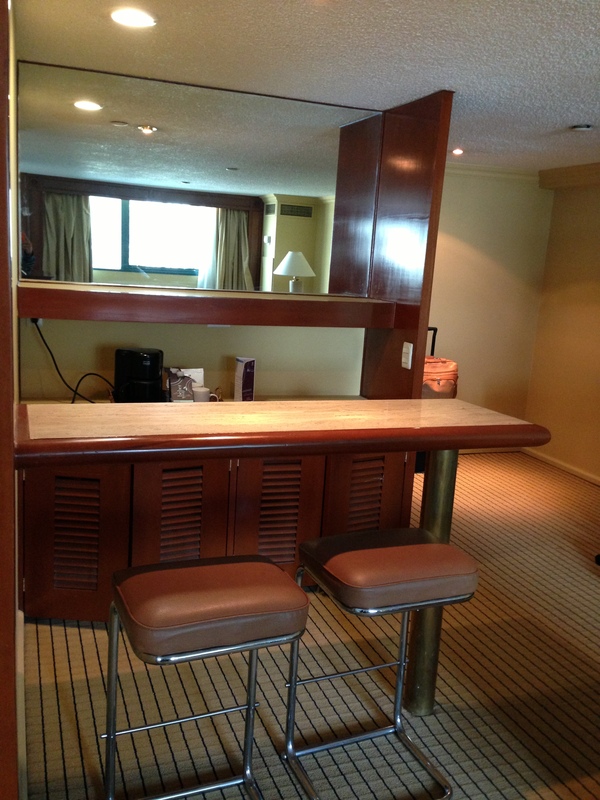 There is a minibar area available if you need to imbibe. 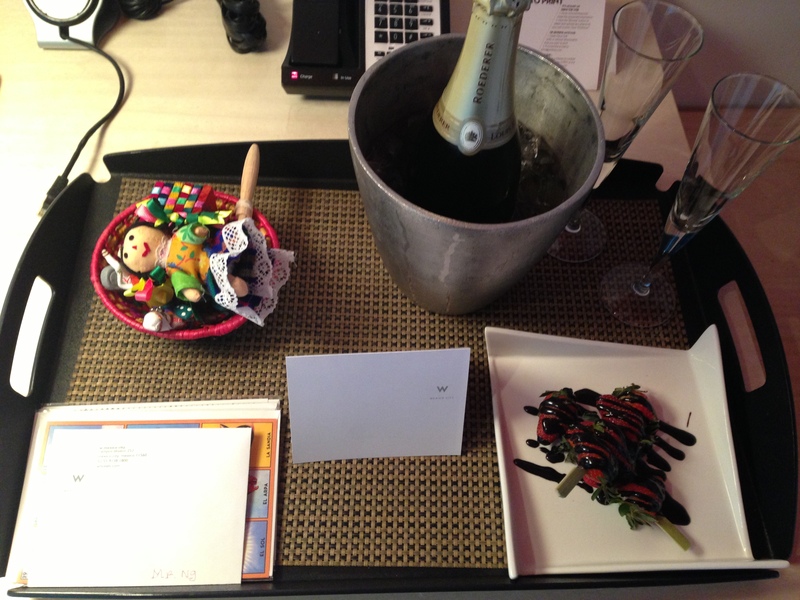 After settling into the room, I wanted to get some work done so I went to the desk and I was surprised by a bottle of champagne, Mexican dolls, postcards, and chocolate covered strawberries. 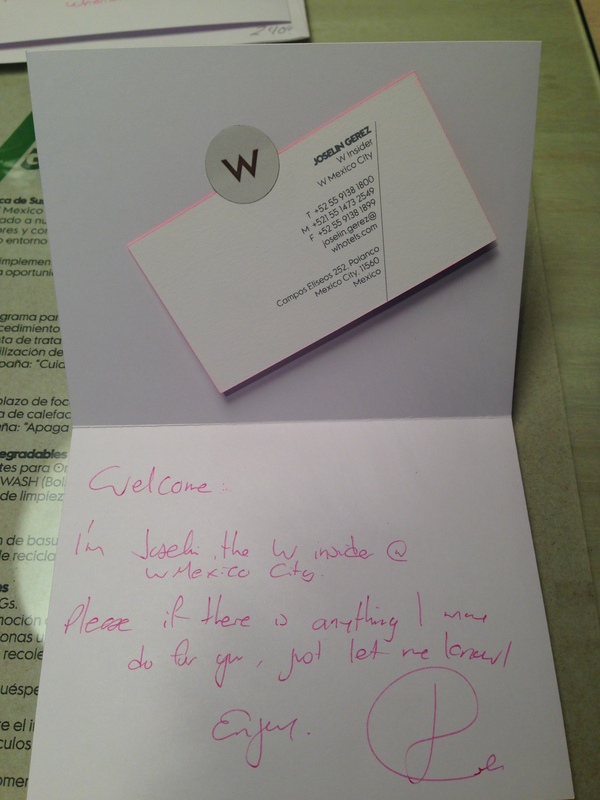 On the greeting card, I was graciously welcomed to the W Mexico City by the W Insider and told me to not hesitate to use the Whenever, Whatever service. Needless to say, I didn’t have a use for it during this stay. I had dinner at Casa Regia later on that evening, which was a fine dining restaurant within walking distance near the W Mexico City. I will review this restaurant in a later post called Various Eats in Mexico City. The W Mexico City is very close and within a 7 minute walk to the Auditorio Subway Metro Station which only costs 3 pesos (~$0.23 USD). The hotel is also within a 5-10 minute walk to high end shopping on President Masaryk street and there are a ton of restaurants to choose from which is also within walking distance around the Parque Lincoln area. Overall, the level of service and attentiveness at this hotel has exceeded my expectations and I highly recommend the W Mexico City if you plan on visiting. I didn’t want to stay in Polanco the whole time, so I booked the Sheraton Maria Isabel and the new Le Meridien Mexico City which will be in the upcoming series of posts. 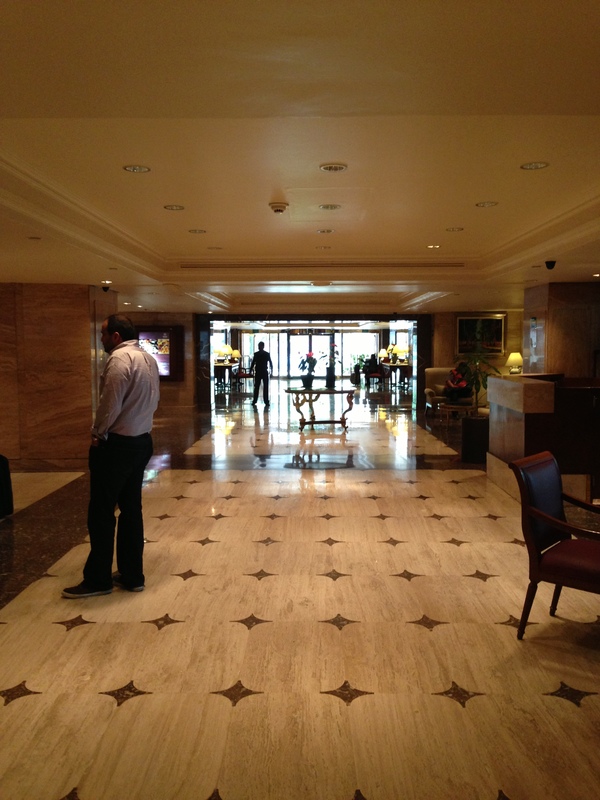 This entry was posted in Mexico, starwood and tagged mexico, mexico city, polanco, starwood, w hotels on January 29, 2013 by jammanxc. After hearing news about the Delta Skymiles devaluation, I decided to blow the last of my Skymiles balance which was sitting below 39k. I was looking for possible last minute trips and you know how hard it is to use 25,000 Skymiles for a roundtrip anywhere in North America. So, I expanded my horizons and decided to search for roundtrips from LAX to South of the border. I decided to use 35,000 Skymiles to MEX on coach operated by Alaska Airlines. I quickly ticketed the award and proceeded to call Delta so I could get my Alaska Airlines confirmation number. Once I had my Alaska Airlines confirmation number, I can then add my American Airlines Executive Platinum number to the reservation. One advantage of that is so that I could choose the coveted bulkhead and exit row seating. I chose an exit seat for the outbound and a bulkhead aisle for the return flight. I’m not reviewing my coach flights from LAX-MEX on Alaska Airlines, but I will have to say that their chicken tamales served onboard with salsa are pretty delicious! 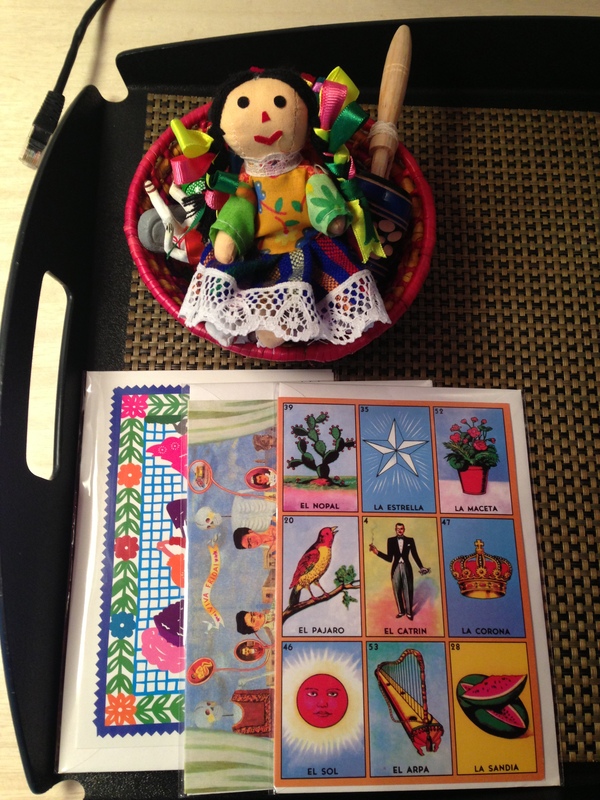 This entry was posted in Mexico and tagged mexico, mexico city, trip report, trip reports on January 28, 2013 by jammanxc. Two weeks ago, it was my cousin’s birthday and he wanted to visit Santa Barbara since he has never been. 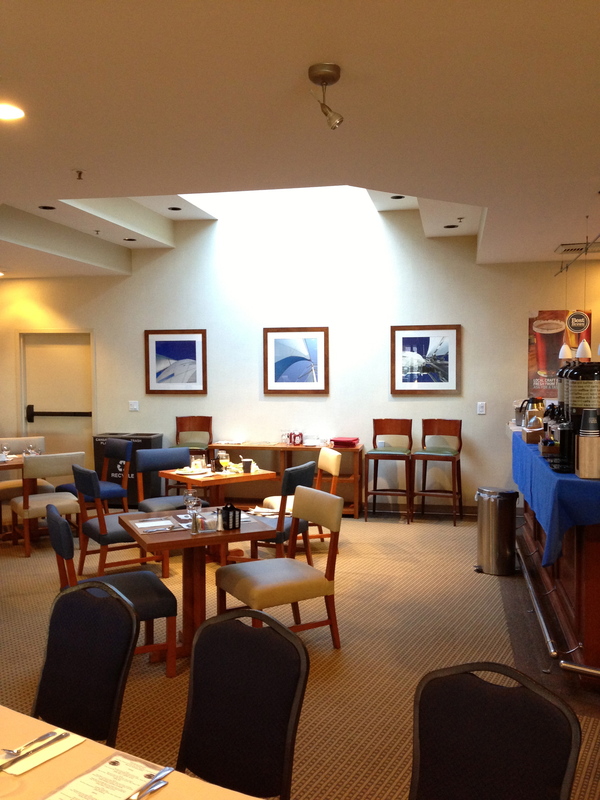 It was a last minute trip, so I fired up spg.com and found out that there are no Starwood properties in Santa Barbara, but there was the Four Points by Sheraton Ventura Harbor Resort which is located 25 minutes away. The standard rate was showing $159 + taxes or 4,000 Starpoints. 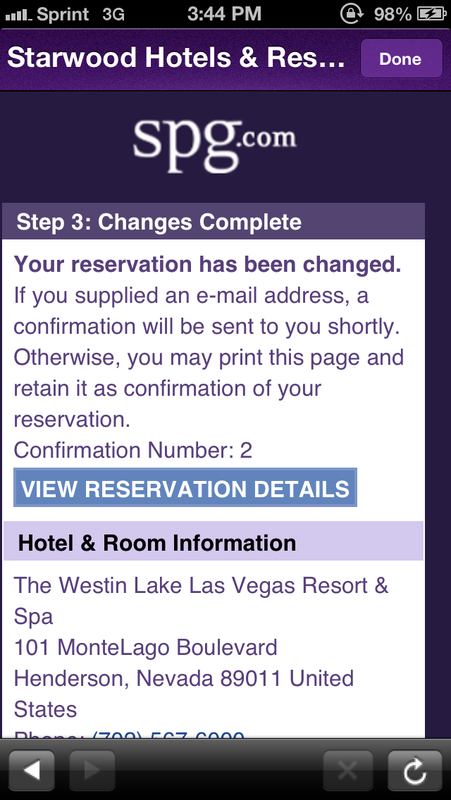 I value 4,000 Starpoints at $120 minimum, so this was a no brainer for a Starwood redemption. I’ve stayed at this property five years ago and since then, it has gone under a huge renovation. It has recently earned its right to be called a Resort in the Starwood portfolio. 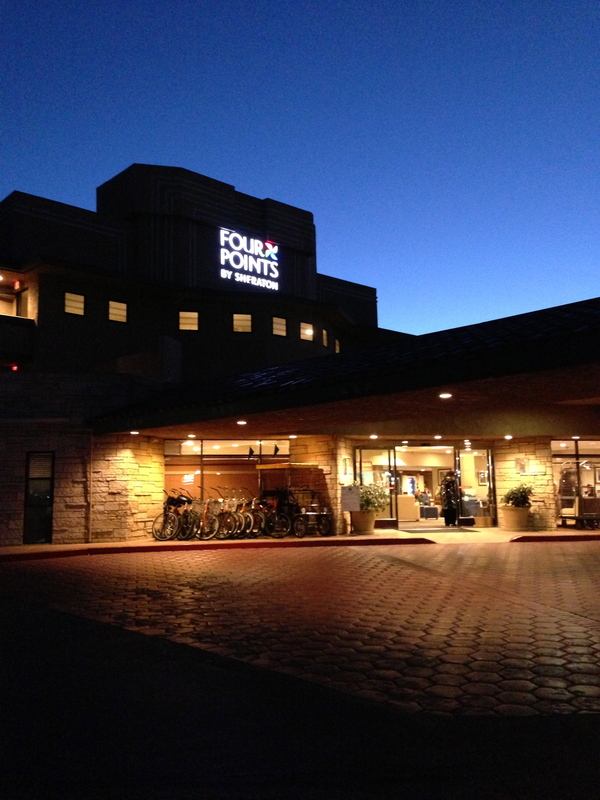 It’s so weird having the words Four Points and Resort in the same sentence, since Four Points is the red headed stepchild of the Sheraton brand. 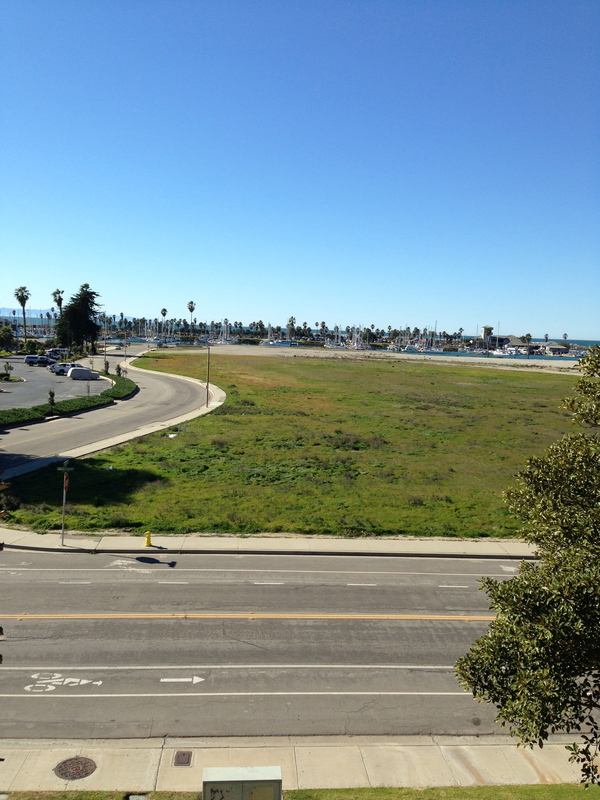 As I approached the Four Points Ventura, I noticed that the parking lot is now secured and gated with a moveable arm. Five years ago, the parking lot was openly free to park and I guess free parking is rare nowadays. The weird thing about this gated moveable arm mechanism is that there is no “Ticket” to grab. As your car approaches the moveable arm, the sensors raise the arm automatically. I thought it was weird since this is suppose to be a secured lot. As I checked in, I was greeted by a cheery front desk agent named Barbara. I asked if there were any rooms available at this time since I arrived at noon. 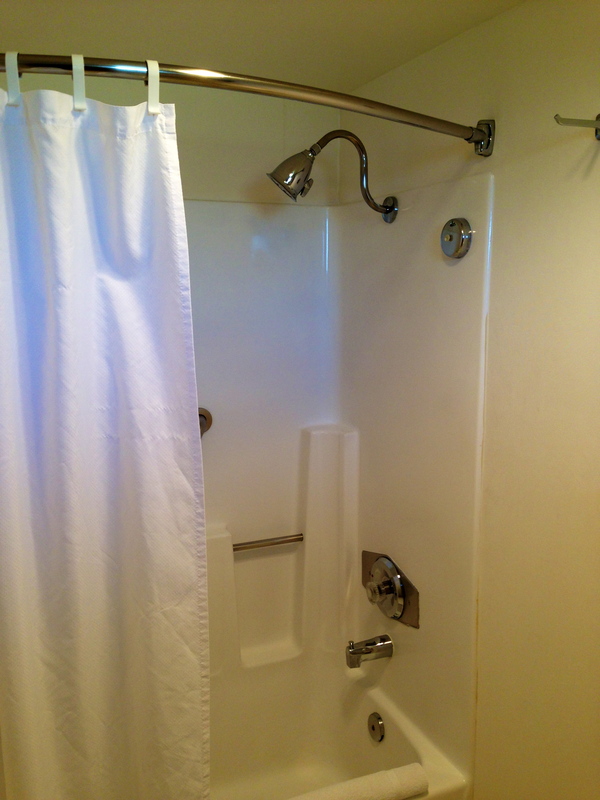 Barbara said that as a Platinum member, I was entitled to the best room available. 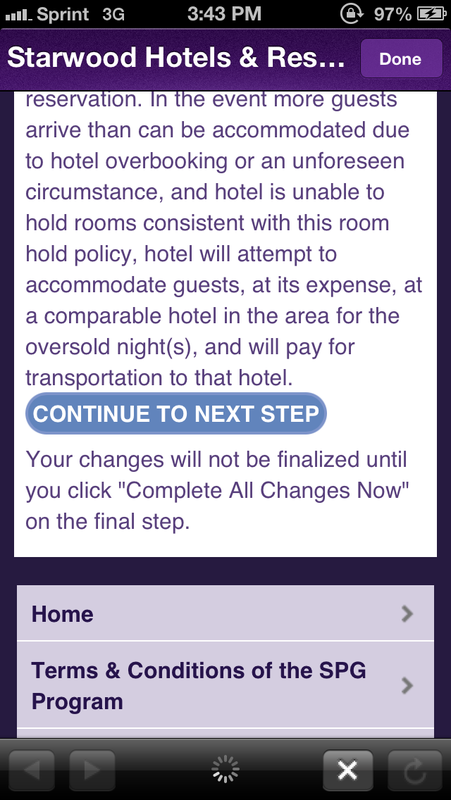 I was pleased to hear this, but I know there wasn’t any suites available since I checked on the SPG iPhone app. Even though I knew there weren’t any suites available, I asked Barbara if there were any suites available anyway. 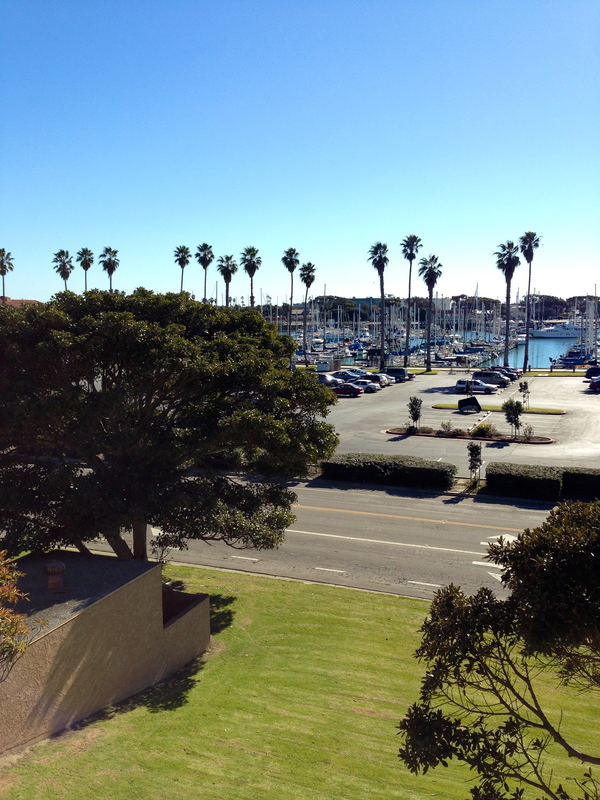 She responded with “The hotel is completely sold out of suites and nearly at capacity due to a huge convention in town.” I booked a standard two queen bed and was upgraded to an oversized two queen bed with an oversized balcony overlooking the Ventura Harbor. Barbara was overjoyed and rest assured that I will like the room and can invite my friends over for a party, which she kidded. 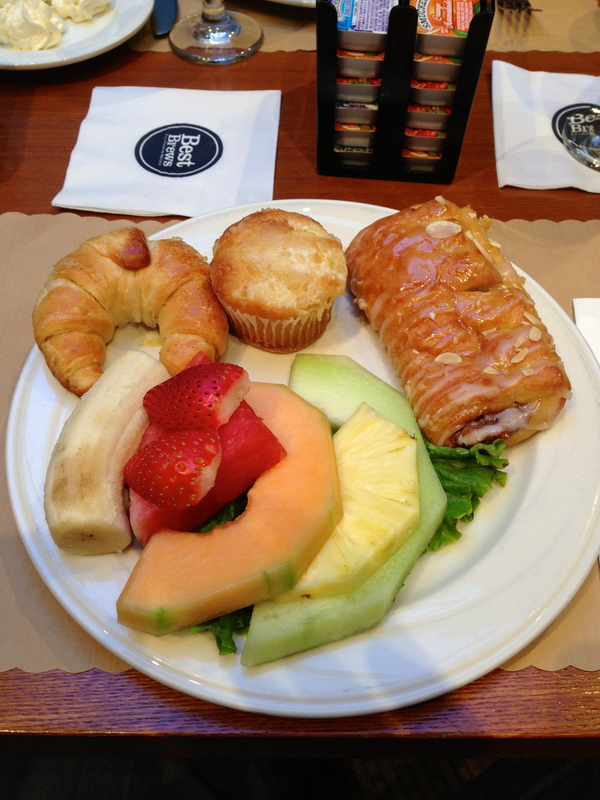 i inquired about the possibility of having breakfast as a Platinum amenity and she said that it was a continental breakfast which consisted of pastries, fruit, juice, and coffee. 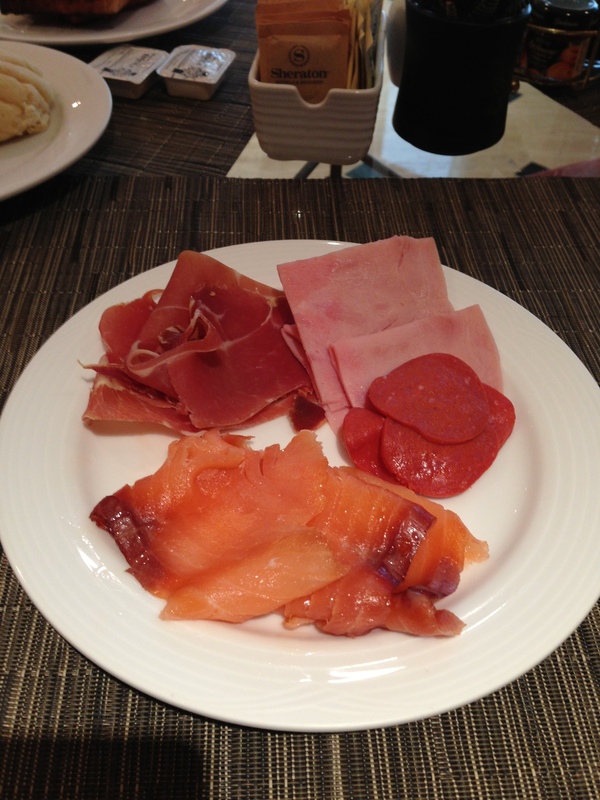 I value breakfast for two much better than 250 points as a Platinum amenity at a Four Points property. 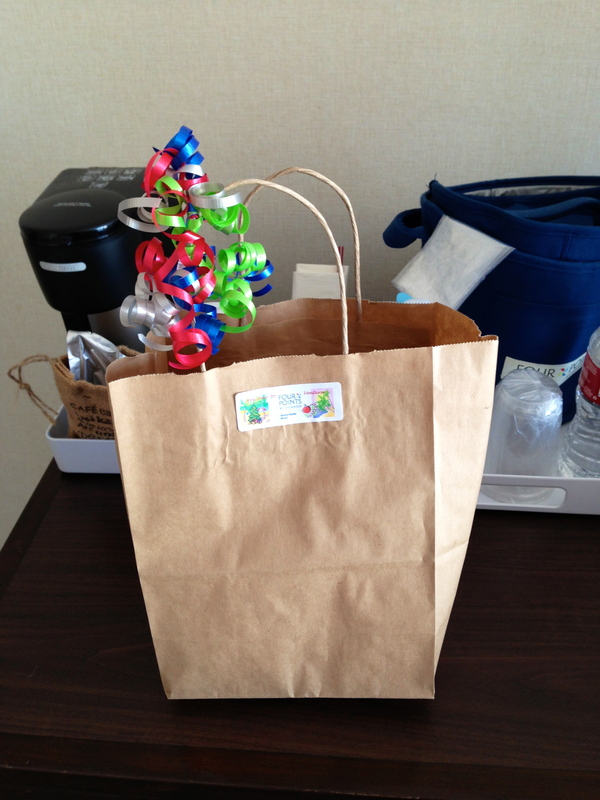 Barbara handed me a colored ribboned goodie bag for Platinum members, which consisted of a granola bar, 2 bottles of water, 2 apples, and various candies. I asked Barbara about the possibility of a late checkout, but she said she could only do 1 or 2pm. I didn’t press the issue further because I didn’t need it. I believe as a Platinum member, a 4pm guaranteed late checkout is granted except for Resorts and Conference hotels. There is also free wifi available throughout the property regardless of your Starwood hotel elite status. I was curious and asked about the parking gate arm and why there wasn’t a ticket mechanism. She said that the hotel was working on it and asked if I parked my car. (Doh, I should not have mentioned it). I replied with yes and she responded with “There is a $10 overnight parking charge” and she noted it on my account. I should have shut my mouth so be aware if you are staying at this property to not mention that you parked your car or else you will be hit with a $10 parking charge. I don’t know how else you can arrive to this property without a car! As I approached my room, I was greeted with a large room equivalent of a junior suite. 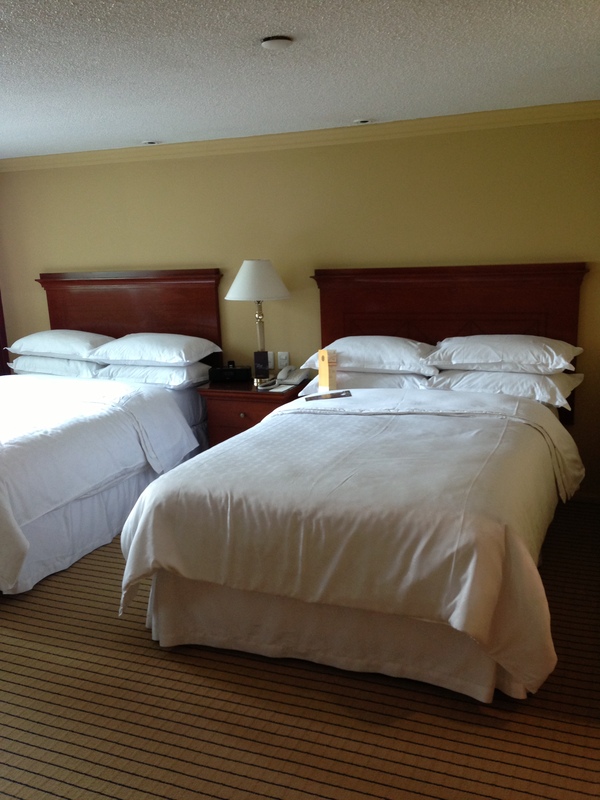 There was definitely a lot of space to move around even placing the two queen beds in the room. 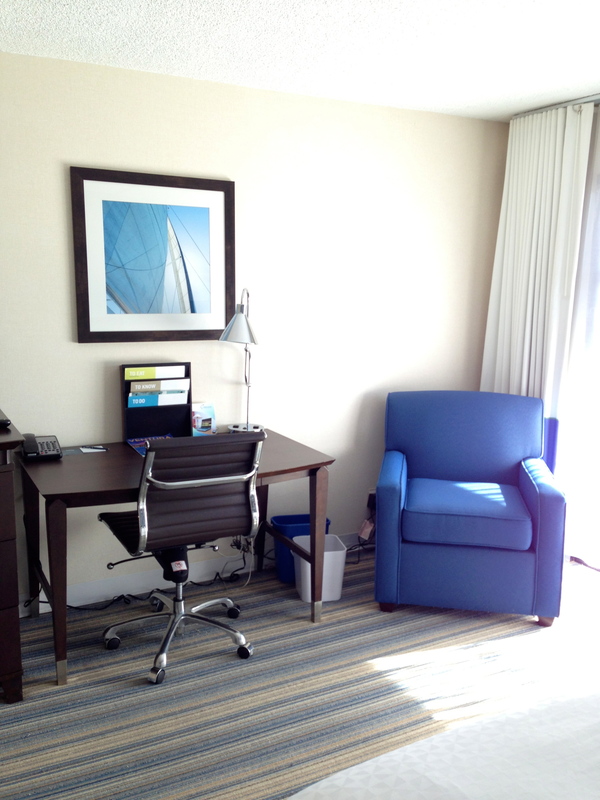 There was a large 32″ TV, oversized executive desk, and a blue fabric chair. 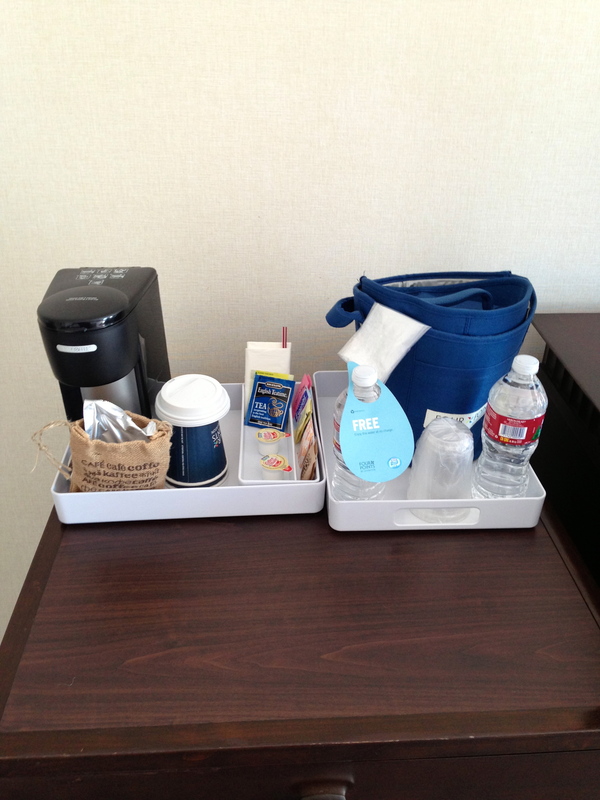 There were two complimentary bottles of water along with a coffee maker and tea. 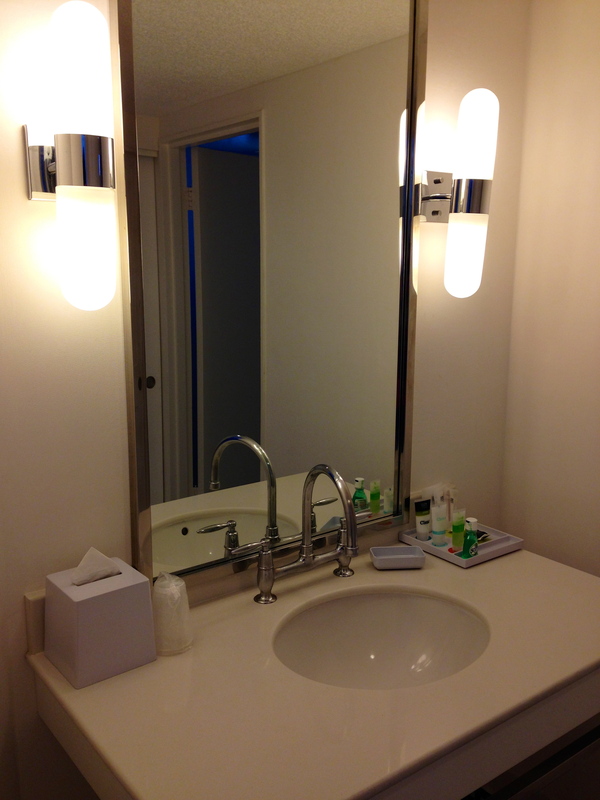 In the bathroom, there are various amenities such as mouthwash, bar soap, shampoo, conditioner, lotion, shower cap, cotton balls, and a nail filer. 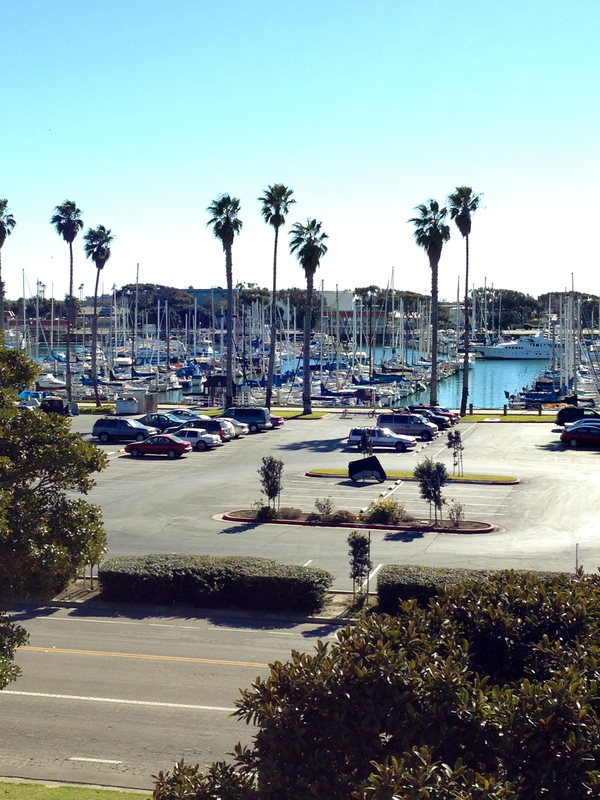 The best part about the room was the balcony and its fantastic view of the Ventura Harbor. This balcony reminded me of the Cosmopolitan Wrap-around Suite Balcony where you can fit a large party of 20 comfortably. 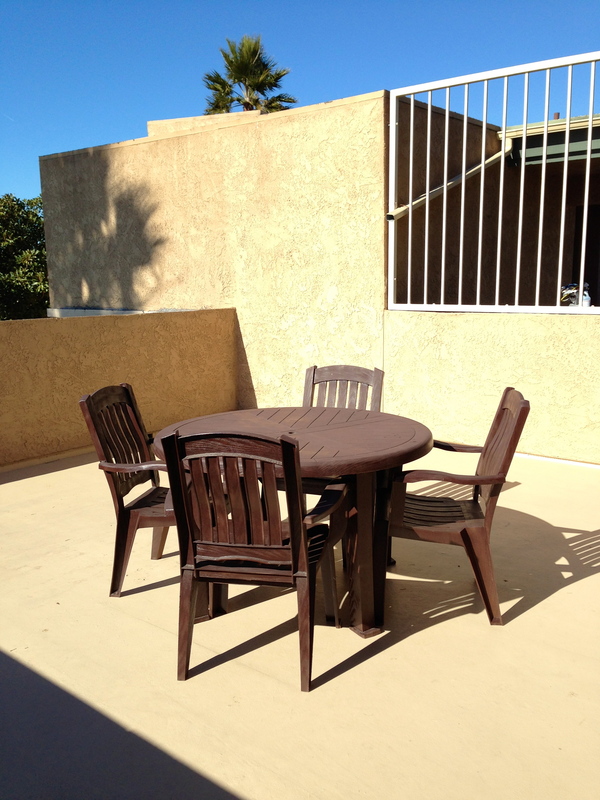 The balcony also consisted of a large wooden table with four chairs. 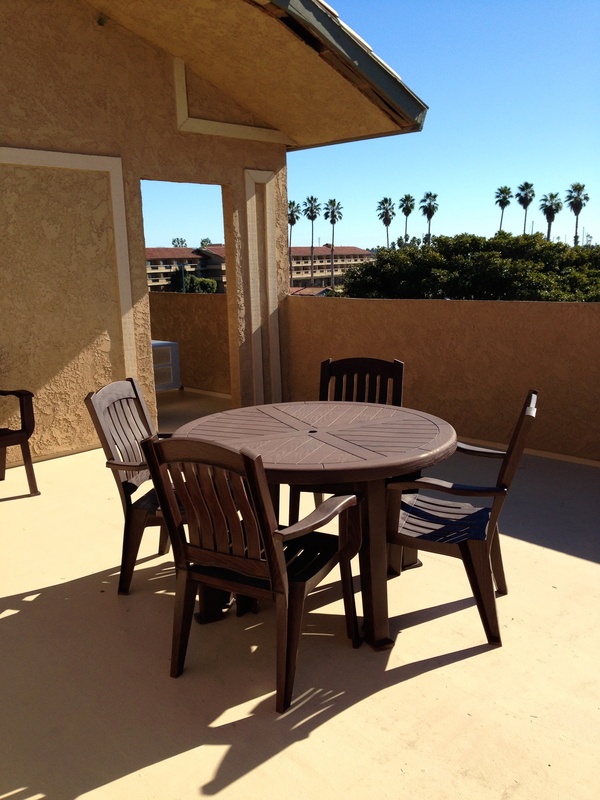 I don’t know what the party policies are for the Four Points Ventura, but you can really throw a serious party and even fire up a BBQ since it’s outdoors. With all jokes aside, I’m sure there is a no party policy and definitely a no lighted fire ordinance in a hotel room balcony even if you bring your own BBQ. 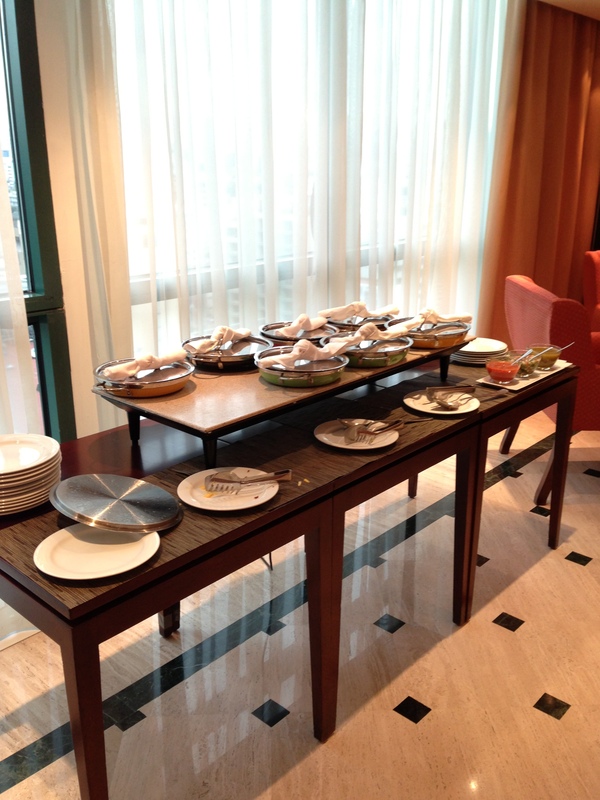 The Platinum continental breakfast included hot pastries and fresh fruit for up to two guests. 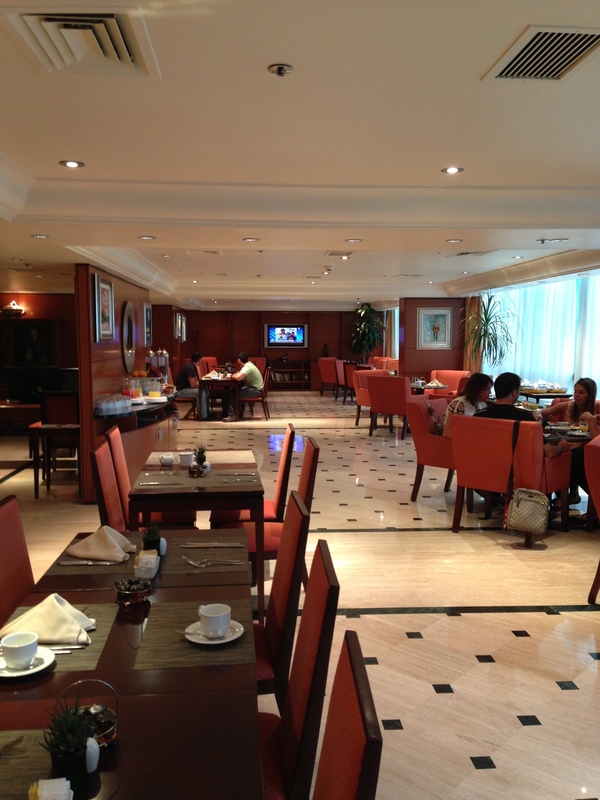 There is no buy-up to have the full breakfast buffet, but it was located at the lobby lounge outside the hotel’s main restaurant which was kind of odd. Overall, I would definitely stay at this hotel if I needed to be around the Santa Barbara, Ventura, Oxnard, or Camarillo area since it’s basically the only Starwood in the California Central Coast community. The Platinum recognition was awesome, but the parking charge downright stinks. In the end, I received 10 Starpoints for the parking charge, so I don’t’ know how the Four Points codes it since you don’t normally earn Starpoints for parking. Hmm….. seems a little fishy! 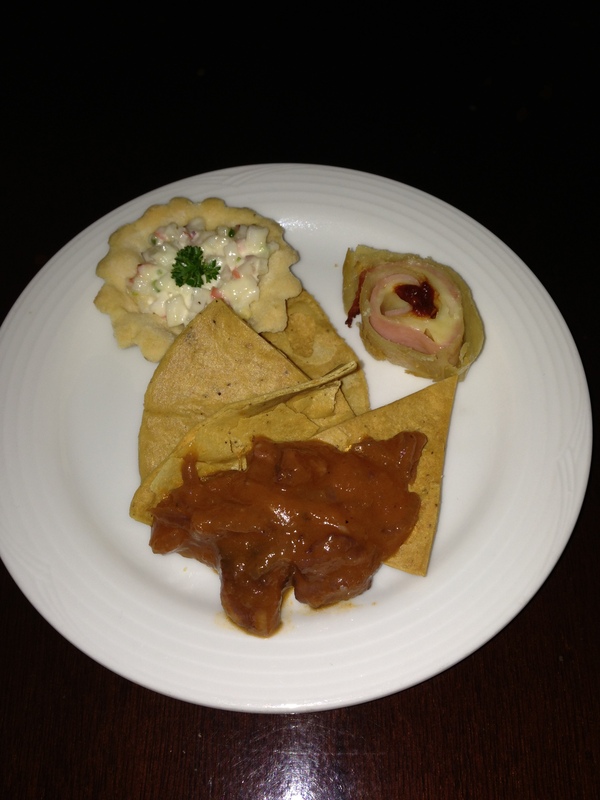 This entry was posted in starwood and tagged four points, sheraton, spg, starwood, ventura on January 28, 2013 by jammanxc. Two weeks ago, I bought tickets to the San Francisco 49’ers game against the Green Bay Packers and I used 9,000 Avios to book the roundtrip flight. The million dollar question I ask myself was, “Where do I stay?”. Since I am only loyal to Starwood Preferred Guest and I’m a Platinum member, I only look ar Starwood Hotels first. 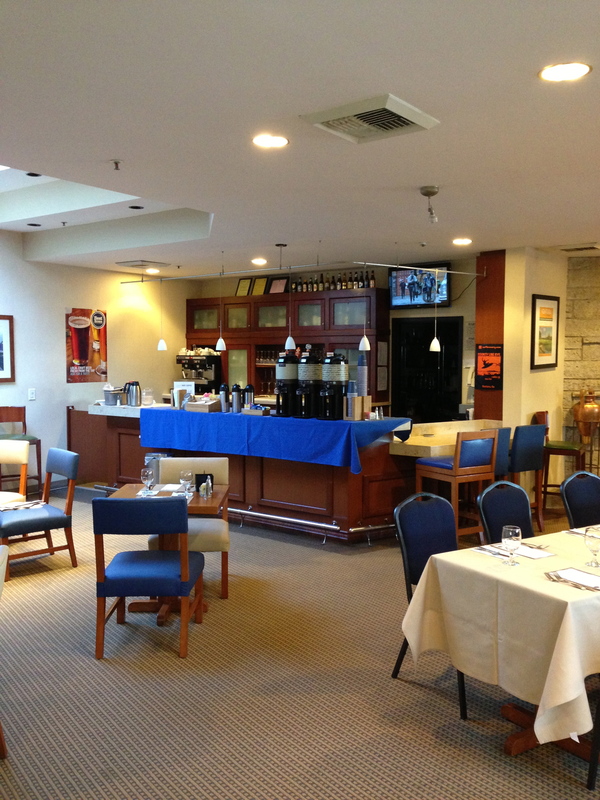 I wanted to stay near the airport since Candlestick Park is nearby and I found a low AAA price of $109/night + taxes for the Aloft SFO Airport hotel which I consider bargain. 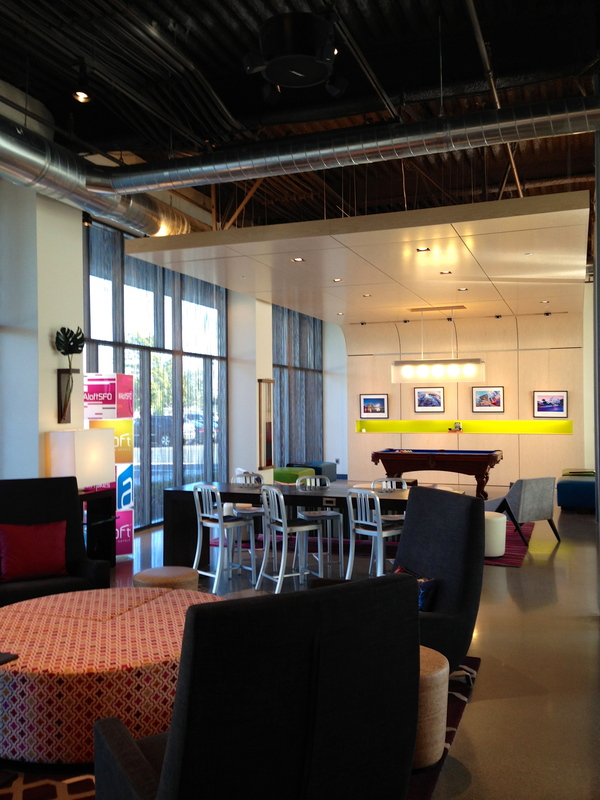 I have never stayed at an Aloft hotel before because there are so few of them around the world. 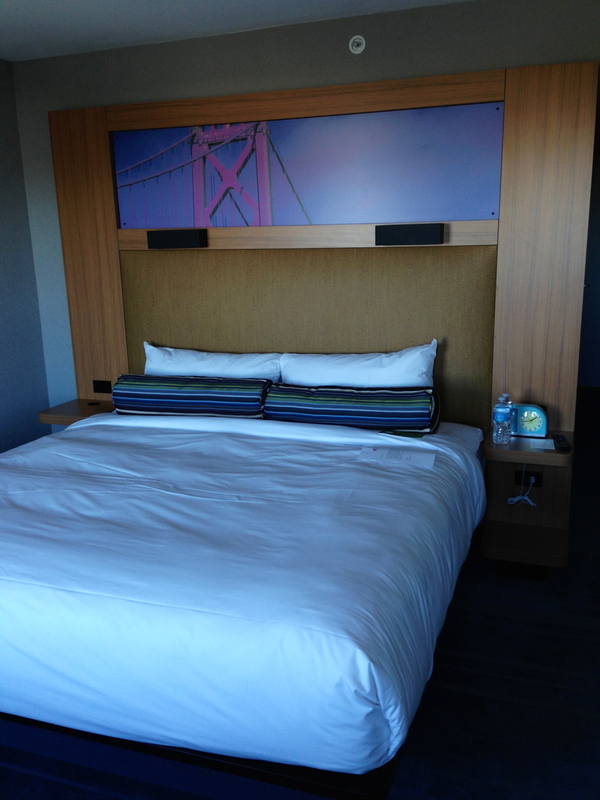 Last year when I went to San Francisco, I stayed at the Westin SFO Airport hotel and passed by the Aloft SFO several times when it was under construction. 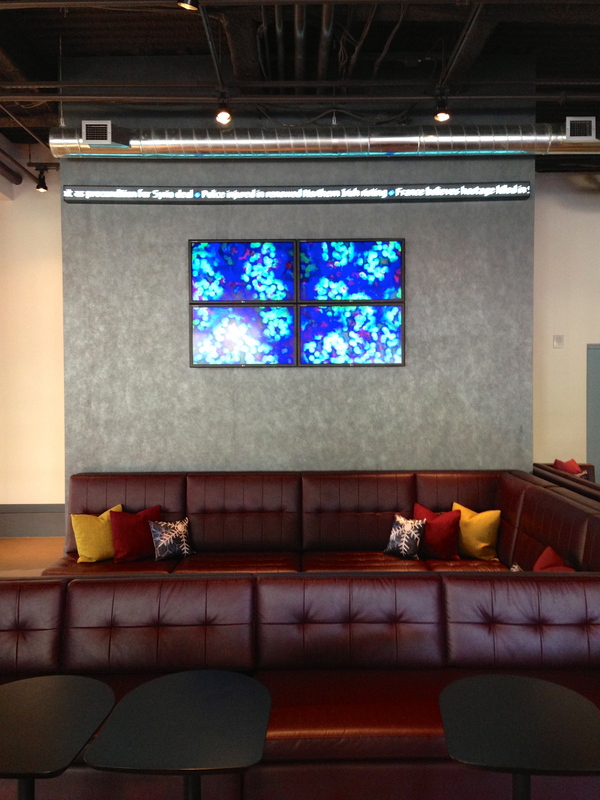 The Aloft SFO is a recently new property that was converted from a Clarion hotel. Having checked out the property on spg.com and knowing beforehand that overnight hotel parking was $20/night, I began to look for alternatives. Thankfully, my stay was on a weekend and there is a nearby BART station in Millbrae that doesn’t charge for parking on Saturday and Sundays. The Millbrae BART station is a 10-15 minute walk to the hotel which is basically located on the same street on Millbrae Ave. It’s tricky to cross the bridge since there is an on-ramp for the 101 freeway that cars basically speed to get on even though there is a marked crosswalk. So, be careful and look for oncoming cars before crossing since there are no signal lights. 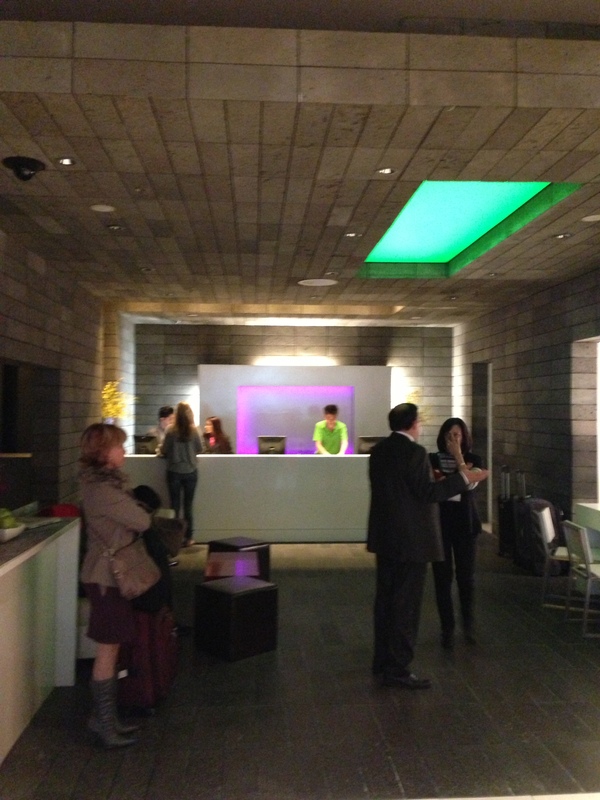 I was astounded on how the Aloft SFO hotel looked from its exteriors because it looked so futuristic. 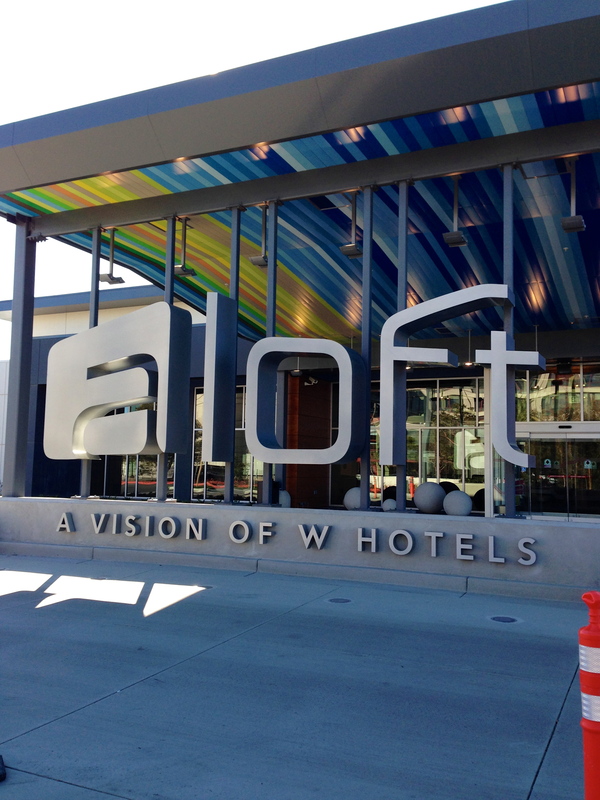 The Aloft hotel is the red headed stepchild of the W Hotels and I say that because the Aloft brand is a W Hotels concept brand. 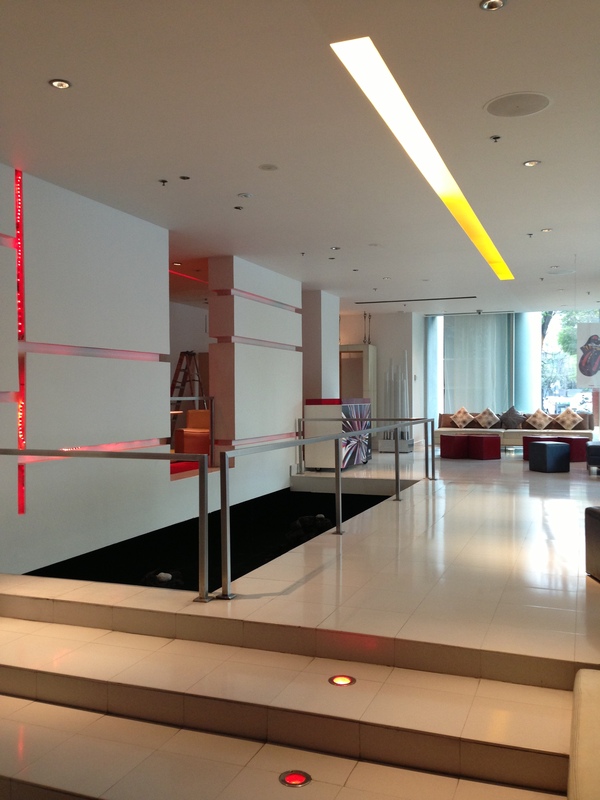 The Aloft tries to be hip like the W Hotel Starwood brand with a trendy lobby, bar, and hotel rooms. 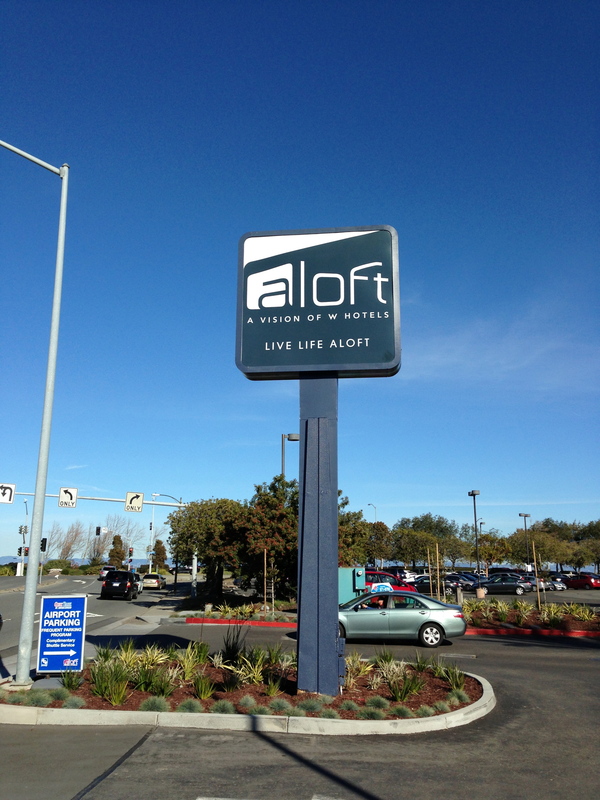 As I approach the Aloft SFO, I hear top 40 music blasting from the exterior speakers. That’s a pretty cool way to approach the lobby since the music sets you up in a good mood. 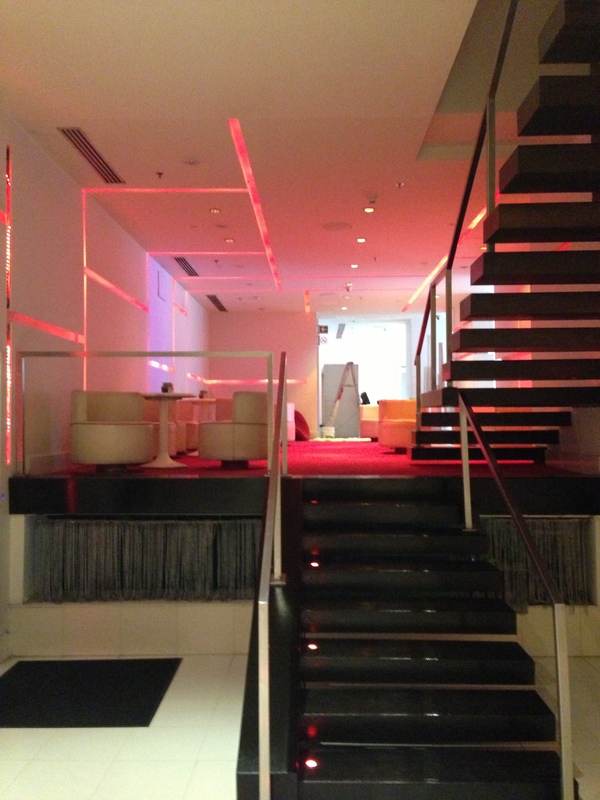 The lobby has a cool, unique, and hip feel to it with upscale modern decor. 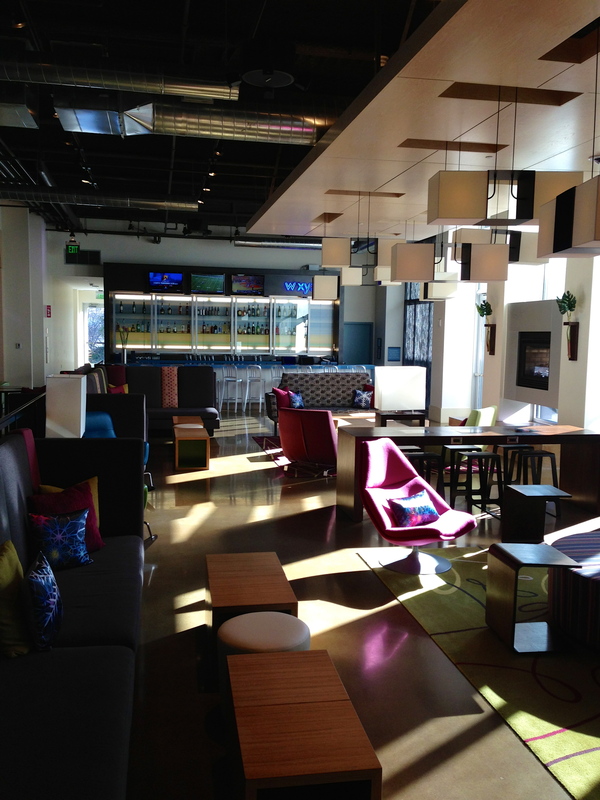 The lobby also has a “Living Room” area where you can watch TV, lounge around, and relax. 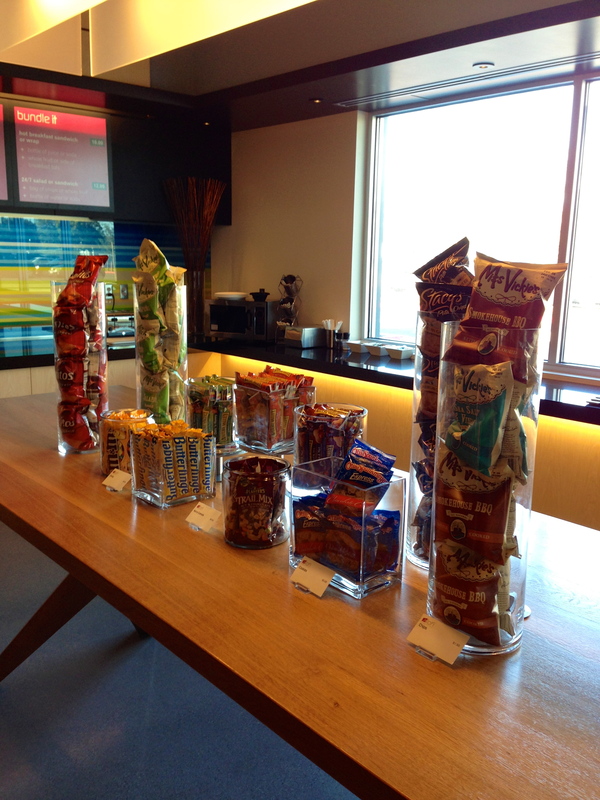 In addition, there is a little market adjacent to the front desk check-in area called “re:fuel” where you can purchase snacks and drinks. 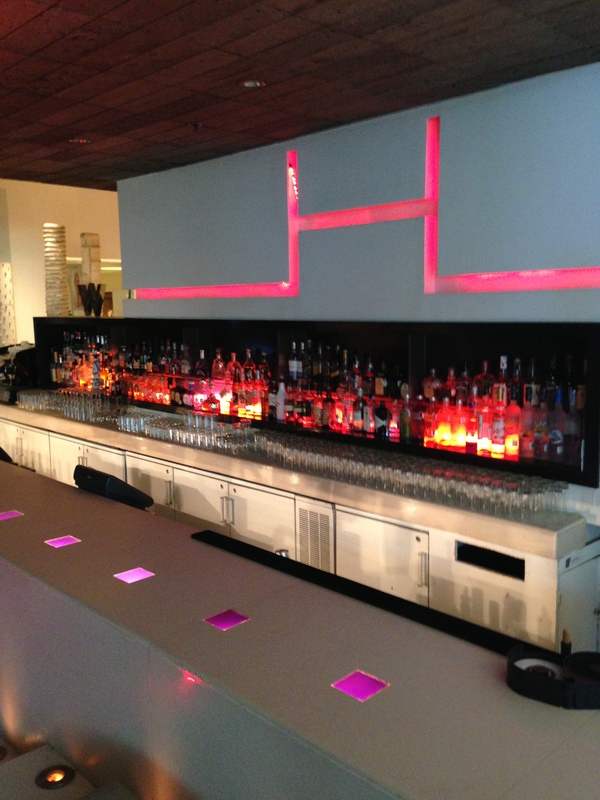 You will also find the wxyz bar in the lobby where you can mingle during the night with friends and perhaps meet new people. I checked in during noon and the bar was closed during that time, but the wxyz bar was a happening place during the late evenings. As I checked in, I was recognized as a Platinum member by a young lady and was able to check-in early at noon since standard rooms were available. 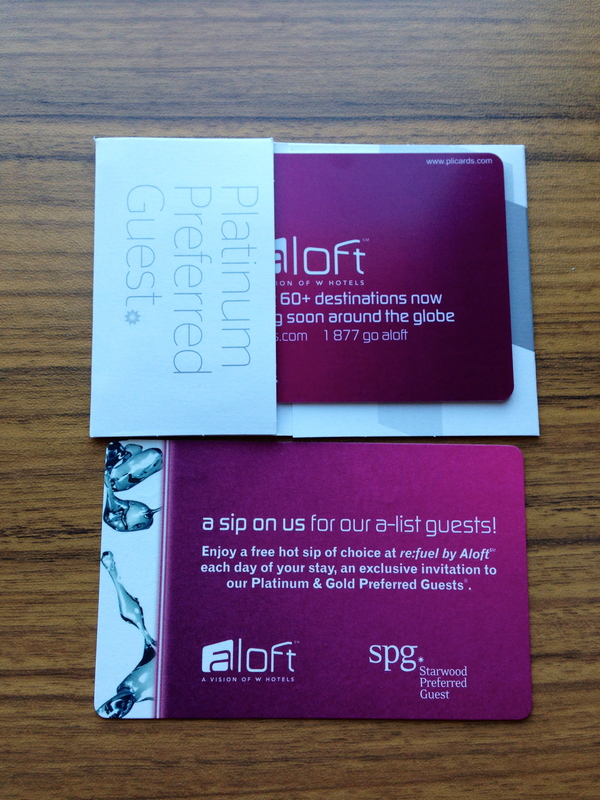 There are no suites at the Aloft SFO, hence there is no possibly of a suite upgrade for Platinum members. 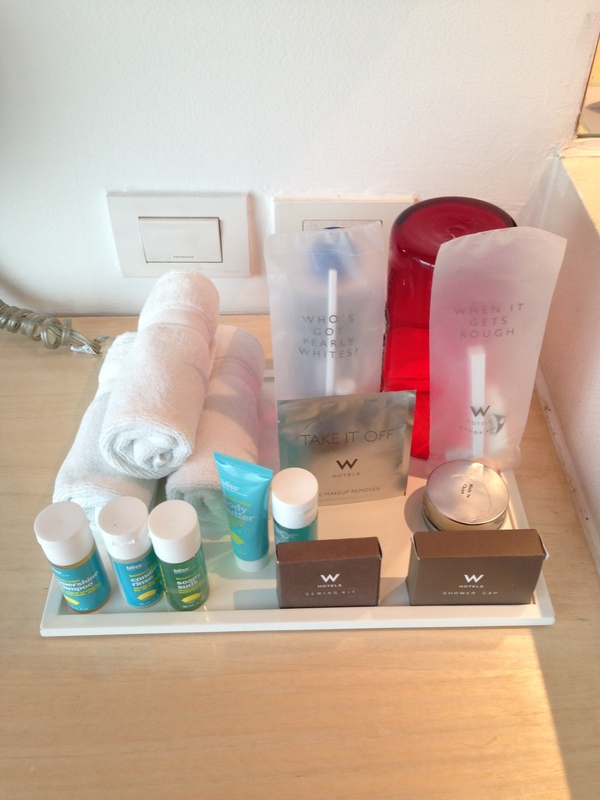 I chose 250 Starpoints as a Welcome Amenity for Platinum members. During check-in, I was presented with a voucher for a free drinks which the coupon says that apparently Gold members can receive as well. 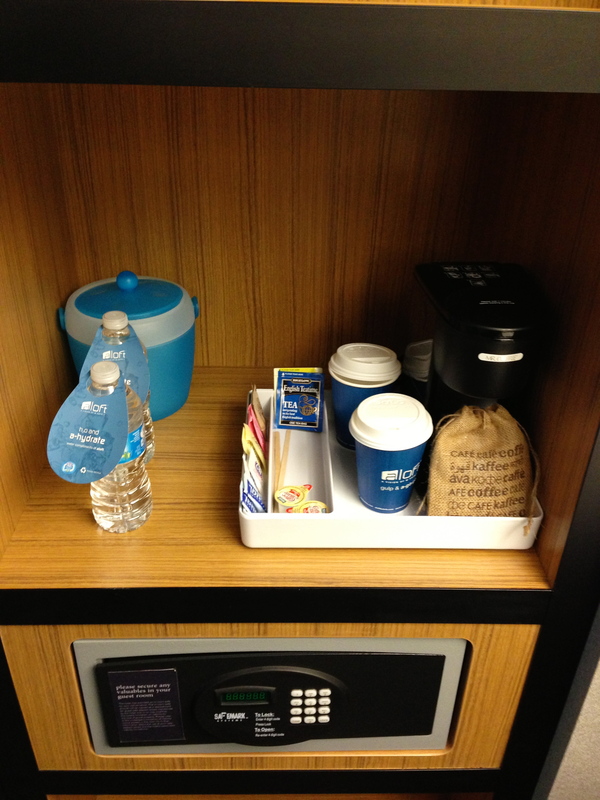 Although the voucher says “enjoy a free hot sip on us”, you can choose any kind of drink from the “re:fuel” refrigerator. I chose to keep my voucher to redeem for the morning after, which I redeemed for a Naked juice. 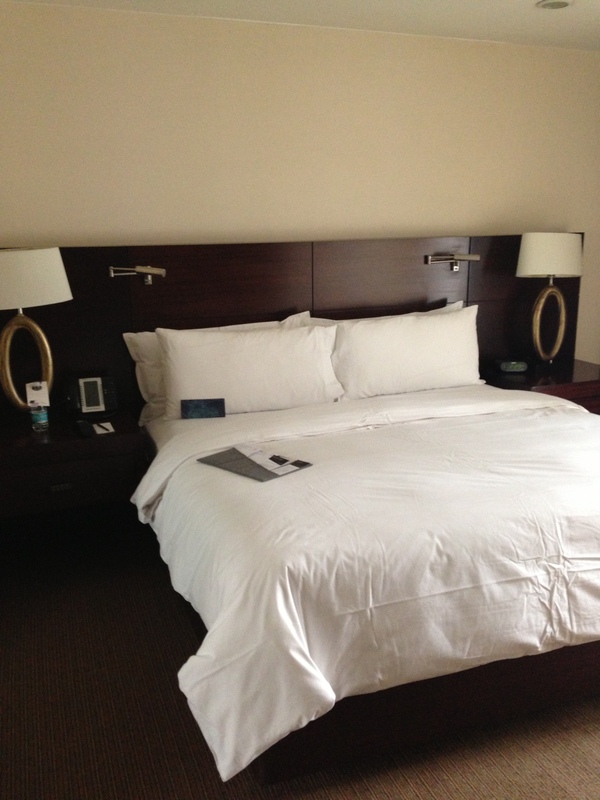 As I entered the room, I was encountered with a large working desk and a large King sized bed. 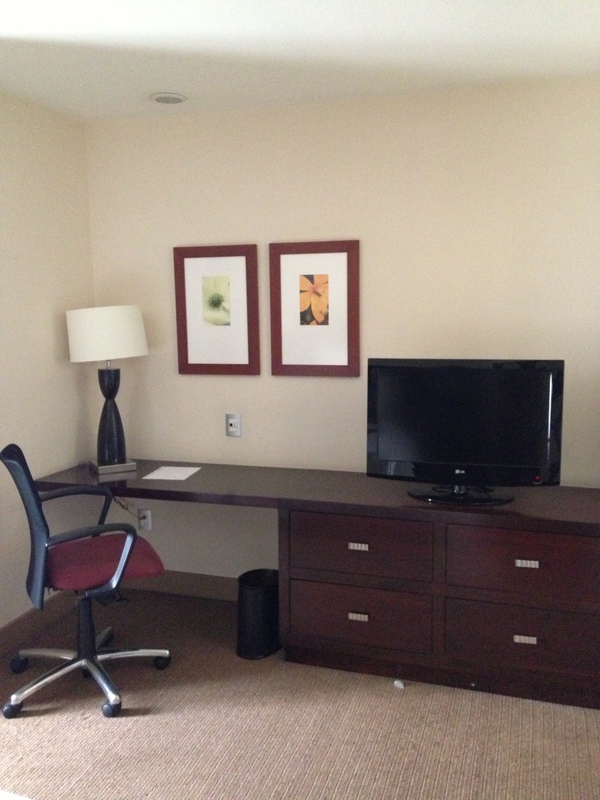 It’s a no frills airport hotel with IKEA-like modern furniture in the rooms. The standard room does its job if you just need a place to crash for an early flight in the morning. 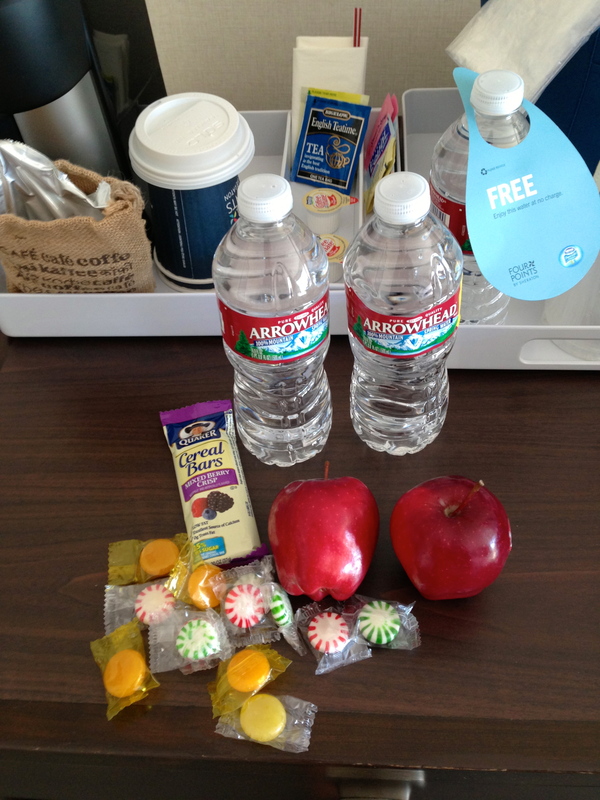 This hotel also includes free wi-fi to all guests regardless of Starwood elite status. 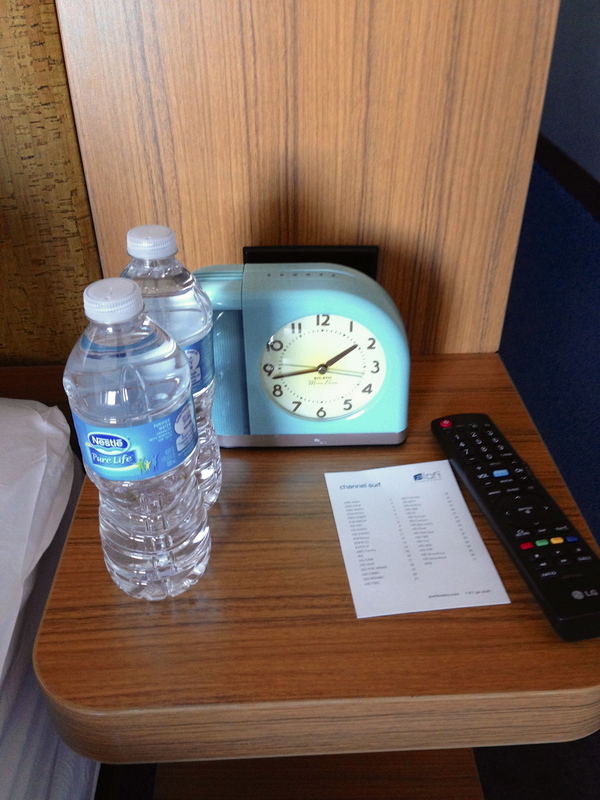 There were two bottles of water in the room by the cool looking blue clock and I also found two more bottles of water in the closet area along with a coffee maker. 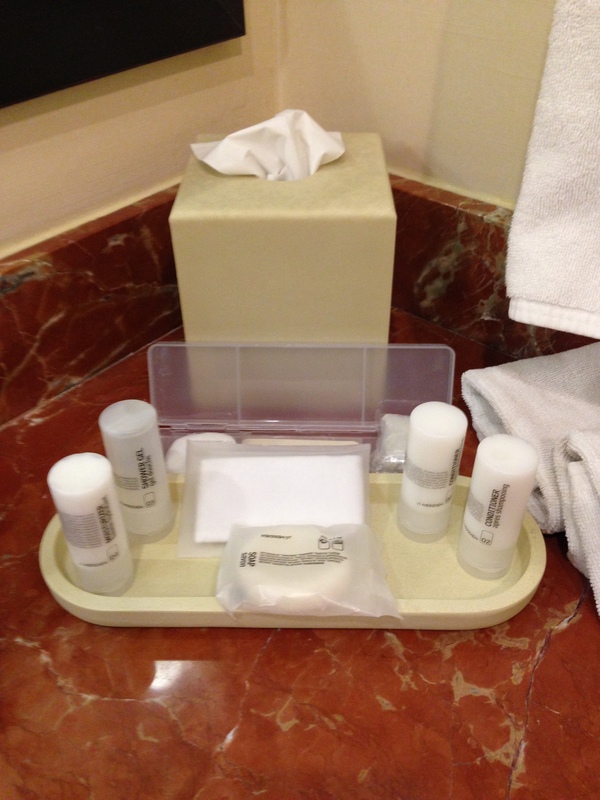 The best thing about the room are the Bliss amenities which can be found in the bathroom. 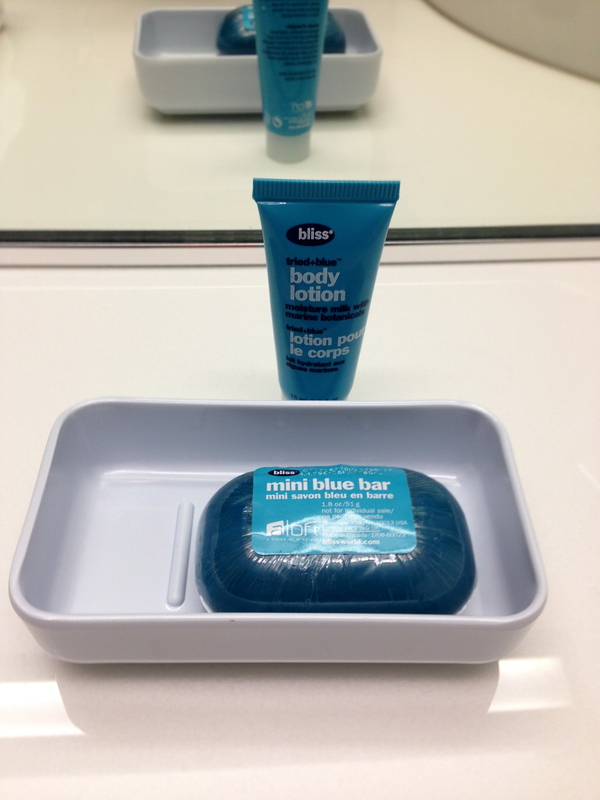 You can find a mini blue bar of soap and a body lotion in the sink area. 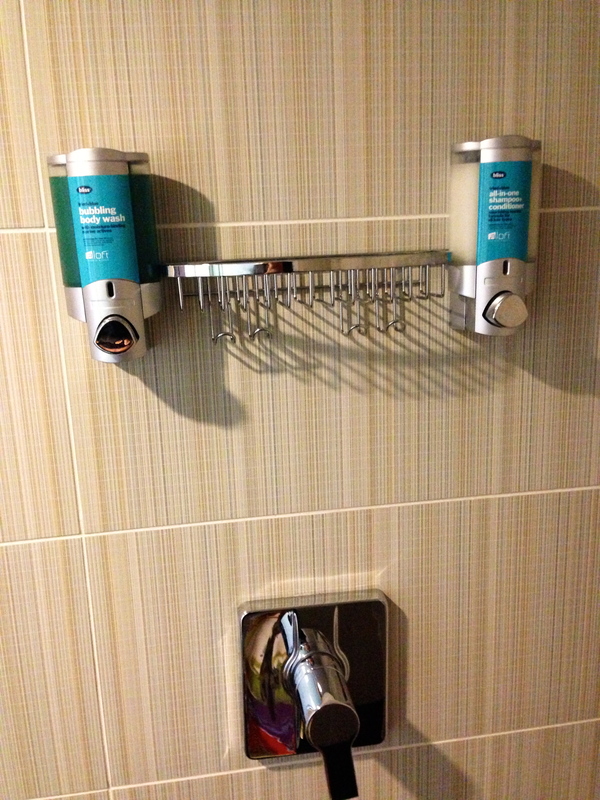 The shower had a built in Bliss shampoo and conditioner, dispenser which is awesome since you don’t have to limit yourself to the small little bottles. I basically stayed in the hotel room for one hour before leaving Candlestick Park festivities. 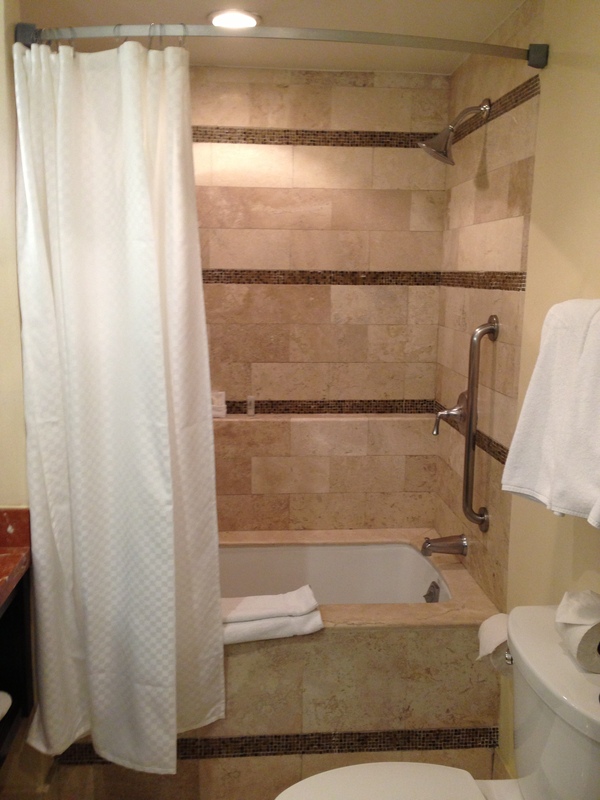 After the San Francisco 49’ers victory against the Green Bay Packers, I arrived back to the hotel around midnight. Earlier when I checked in, there was a letter in the room indicating that there was going to be overnight maintenance on the water pipe infrustruture from 12am-3am. I slept for a few hours before waking up at 4:30am and I noticed that the water looked contaminated as I turned the sink on. I couldn’t be bothered since I had a 6am flight so I didn’t get to take a hot shower as I need to pack and get on the shuttle to SFO airport. I checked out at 5am and told the front desk lady that the water was still contaminated looking even after running the faucet continuously for 10 minutes. She didn’t seem to care, and it angered me because what about the other guests that might have this problem when they wake up. I tweeted out my frustrations to @AloftSFO and @spg and was instantaneously tweeted back by @spg apologizing for the situation. 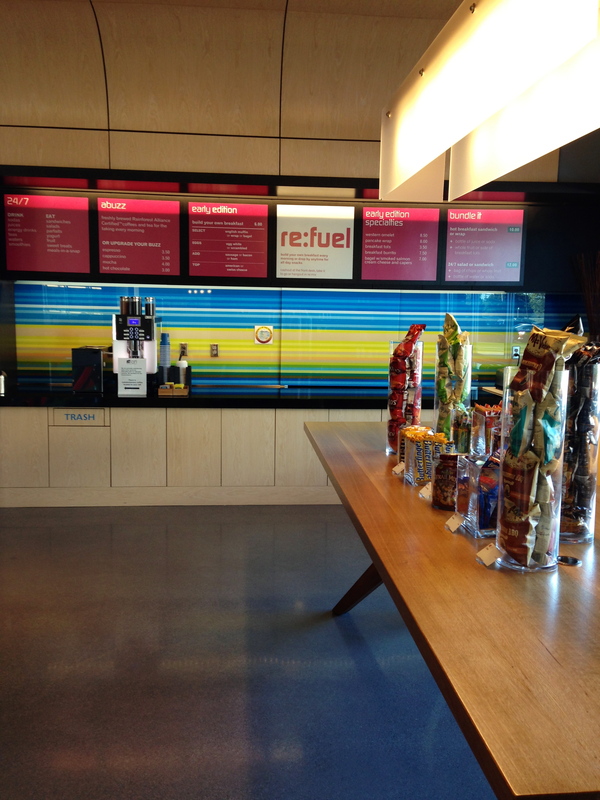 Aside from the water problems, the Aloft is a great property with genuinely friendly staff. The hotel shuttle is shared between the nearby Westin and the Aloft which runs every 15 minutes 24-hours a day. It’s only a 5 minute shuttle ride to the airport and the service is very friendly. 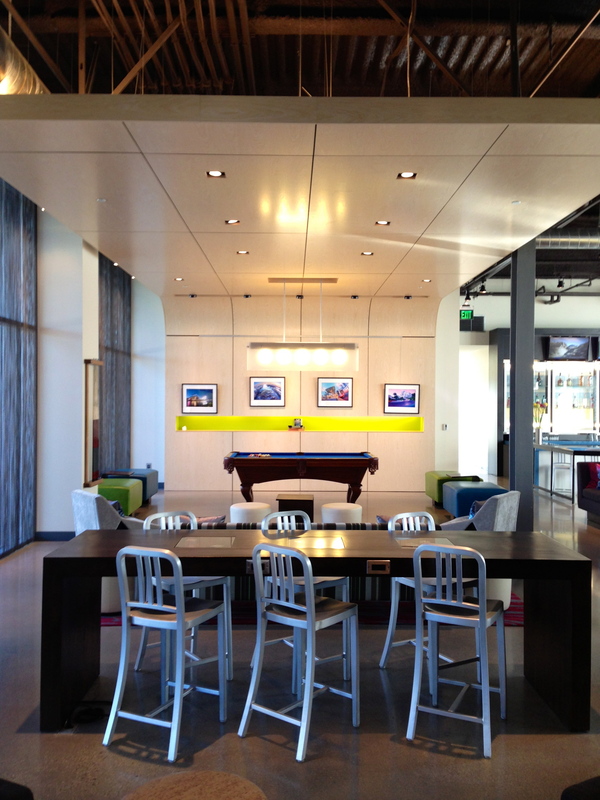 In the end, I heard back a few days later via e-mail and a voicemail from the GM of the Aloft SFO. I replied back to the e-mail and the GM apologized profusely. He invited me back to the hotel the next time I am in town and deposited 3,000 Starpoints as a gesture of goodwill. 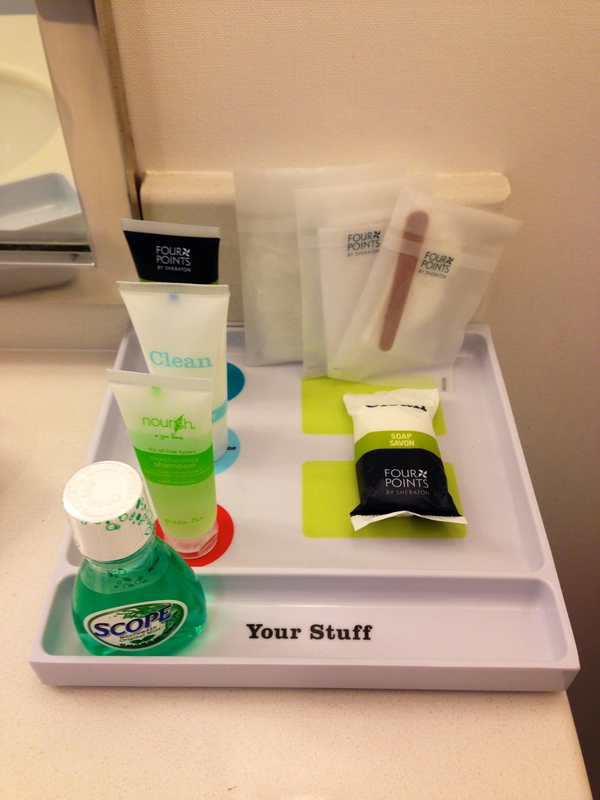 In addition, @spg from twitter deposited 1,000 Goodwill Starpoints to my account. I value the 4,000 Starpoints at 3 cents each, which brings the future rebate redemption value at $120. 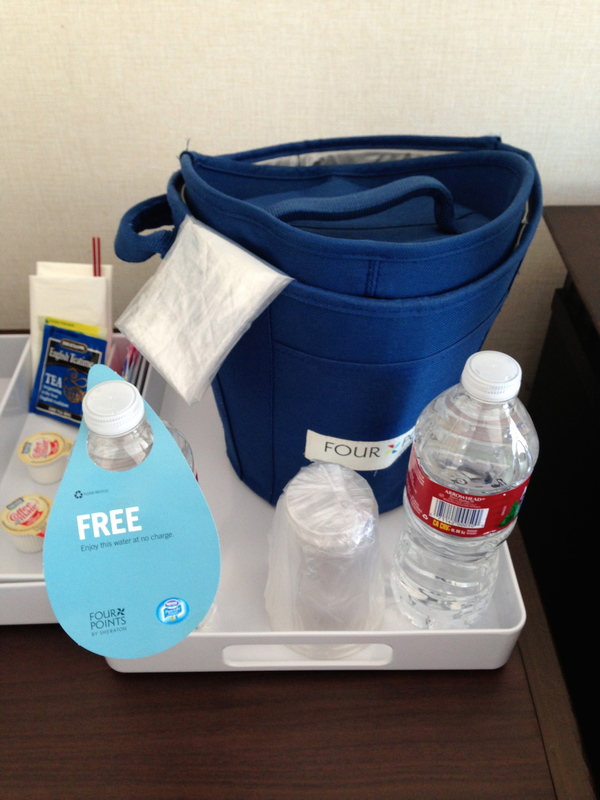 I feel like I received a free stay because of the water inconvenience and because my one tweet to @AloftSFO & @spg made a huge difference. That’s the power of social media and elite status, so use it to your advantage. 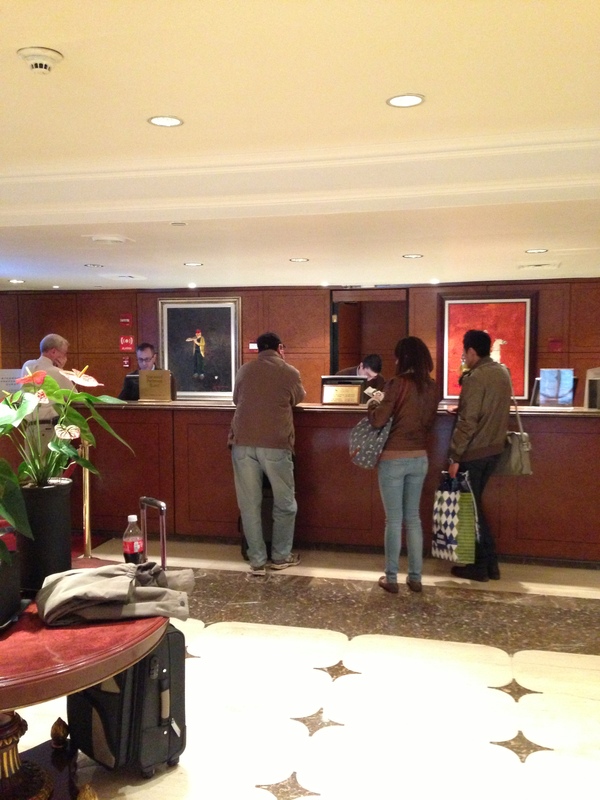 This entry was posted in starwood and tagged aloft, san francisco, spg, starwood on January 23, 2013 by jammanxc. Sometimes you’re just stuck with a third party reservation whether you booked a package deal with a tour group or a travel agent flight + hotel combination package. I like to use American Airlines miles on http://www.useaamiles.com since I get a heavy discount for being an Executive Platinum elite member and sometimes you can find bargain mileage redemption (think of it like hotel mistake fares). Last year I booked the W New York hotel for 5,000 AAdvantage miles on 4th of July week when the hotel was asking $350 + taxes for a standard room on spg.com. After you have booked your third party reservation, I would call the hotel directly to ask if you can confirm your arrival. 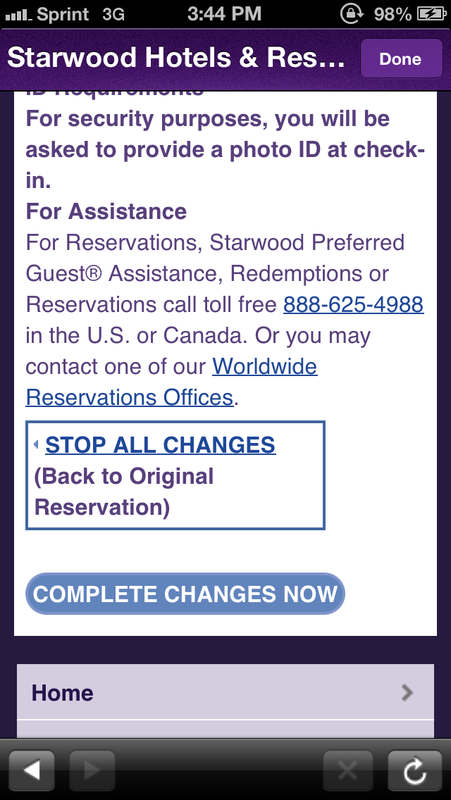 Make sure the hotel operator does not transfer you to Starwood’s main central reservations because they will not be able to help you out on third party reservations. 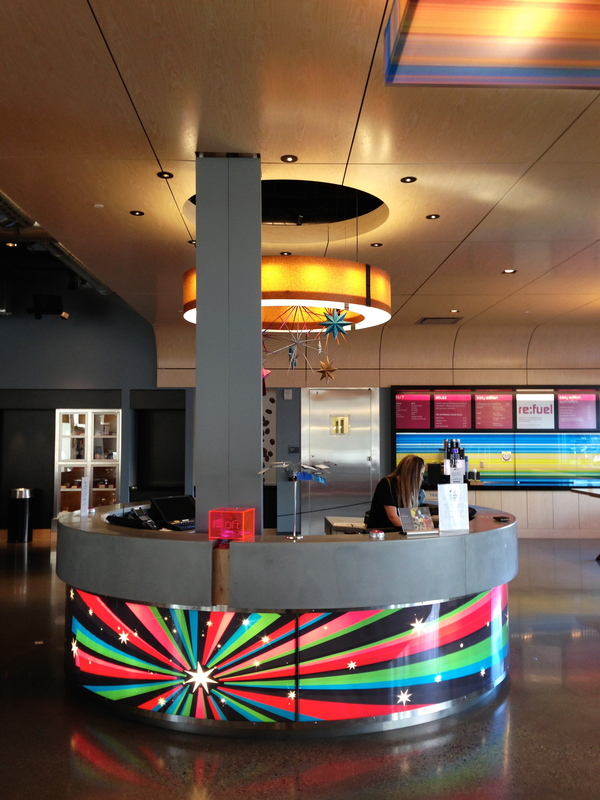 When you get a front desk agent on the phone, simply ask if you can add your Starwood number to your reservation. If the agent can’t find your reservation, then your third party booking company might not have faxed over your reservation details yet. Don’t fret because this happens all the time with third party reservations. In that case, I would give them a call back a week later or a few days before arrival. This is important- Before hanging up, ask what your confirmation number is and write this down. If the agent refuses to add your Starwood number because he noticed that you booked through a third party, I would simply say “I just want to see my reservation on my spy.com profile” or “I understand, but I can earn Starpoints for incidentals correct?”. After you have successfully added your Starwood Preferred guest number to your reservation, you will be able to see it on your spg.com profile under “Upcoming Stays” within the hour. If you do not see your reservation details on your spg.com profile within the hour, then the hotel might not have added your Starwood Preferred guest number correctly. A phone call should remedy this situation. 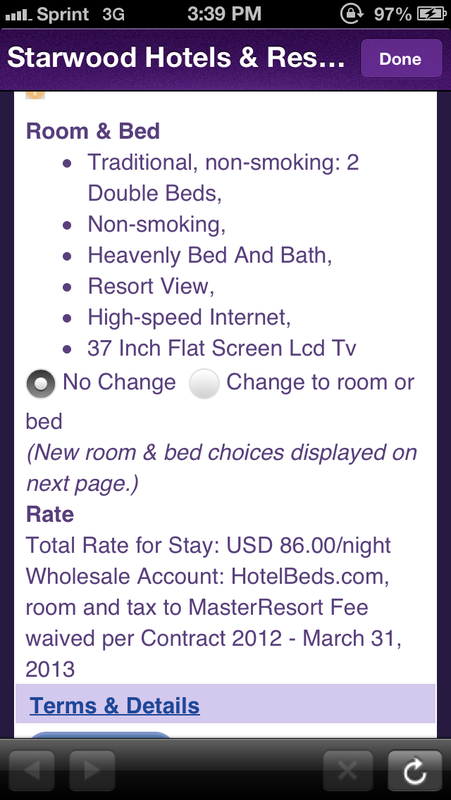 When you log onto your spg.com profile, you will see under the hotel details, “This is a complex rate, we are unable to display your information details” and a “Send Confirmation” button will appear below that text. 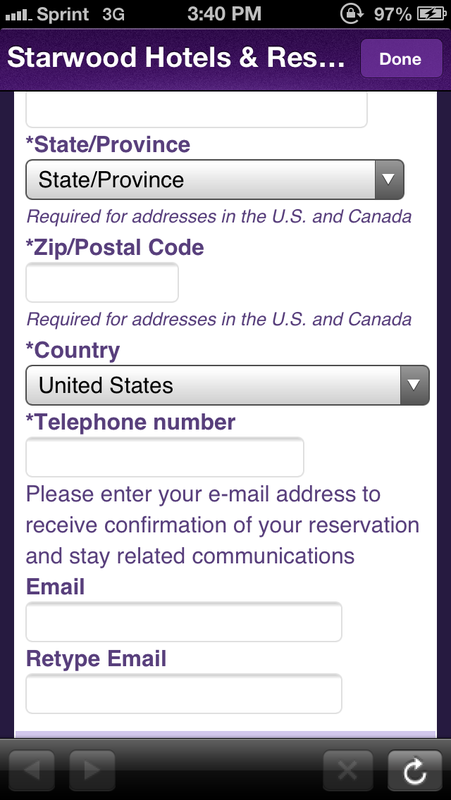 You are most likely not able to successfully click on “Send Confirmation” since your e-mail address won’t be on the reservation. 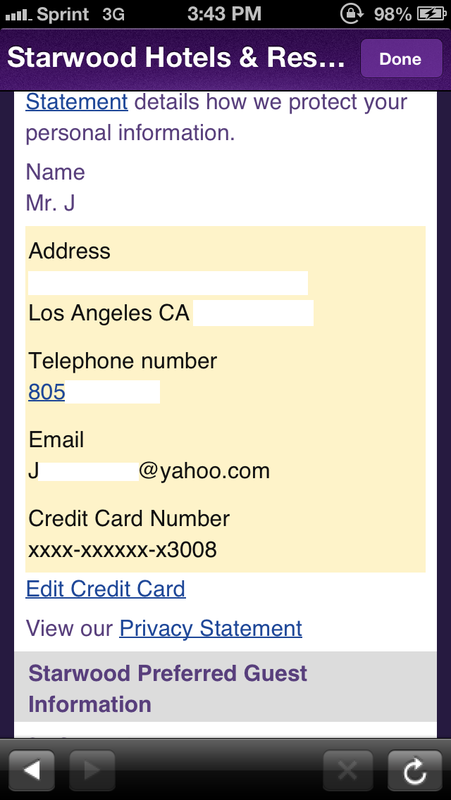 Luckily, I have come across a workaround for adding all your details, including name, address, special request messages, and even apply your Suite Night Award upgrades (if applicable) to your third party reservation. 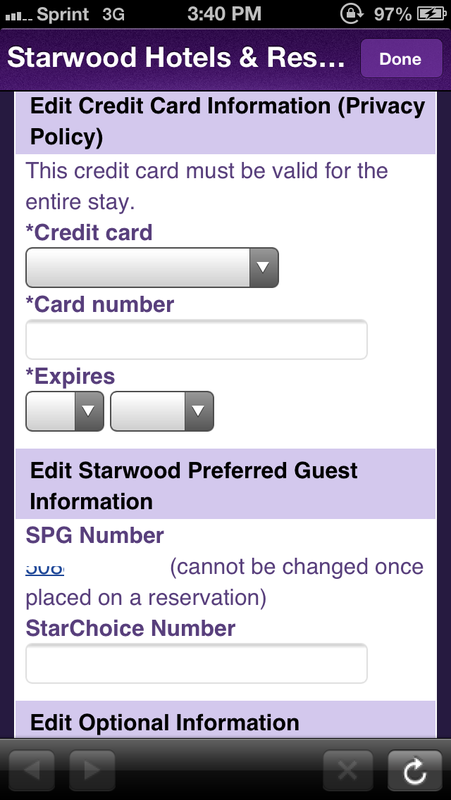 You will need to modify your third party reservation with the Starwood Preferred Guest iPhone App. 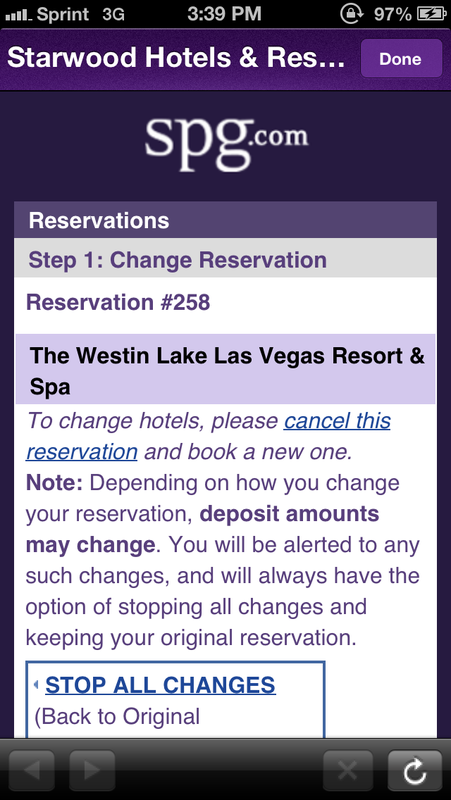 You will be able to see your third party reservation displayed on the iPhone app if you successfully completed the steps prior by asking the front desk agent on the phone to add your Starwood number to your third party reservation. 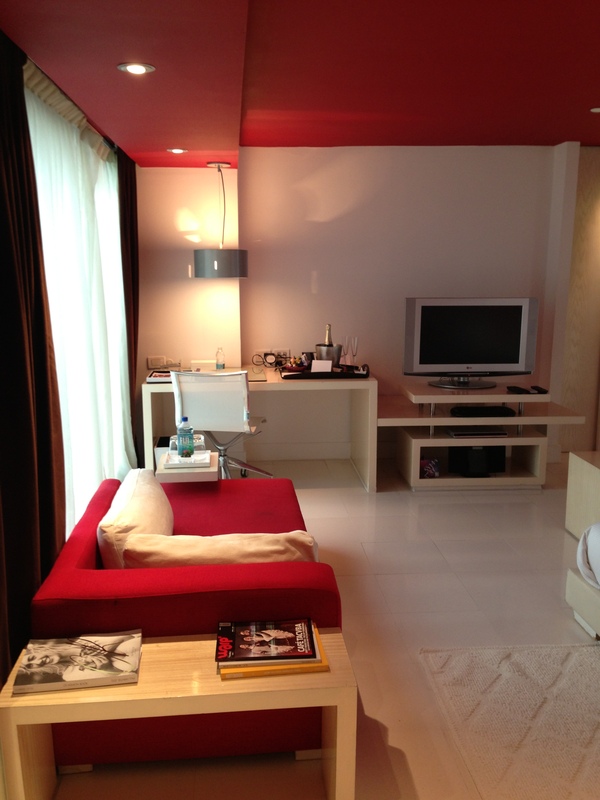 You will be able to see what type of room your third party has booked for you. It is important to not change the Room & Bed or else you will be hit with a change fee. Under the Rate, you can see that the third party paid $86/night for my room and there are additional details including “Resort fee waived per contract”. If you scroll down a little further, you will see a lot of empty fields which you will need to fill in, such as your Title, First Name, Last Name (can’t be modified), Address, City, State, and Zip/Postal Code. You MUST fill in the fields with the asterisks or else you can’t continue to the next step. You also need to enter in your Telephone number and this is the most important step, E-mail address. You will need to enter your e-mail address since the whole point of the “Send Confirmation” is to send your reservation details straight to your e-mail. You are required to enter your credit card number with the expiration date so the hotel can charge you for incidentals. Don’t worry, you won’t get billed for your room rate under any circumstances since this is a prepaid reservation. 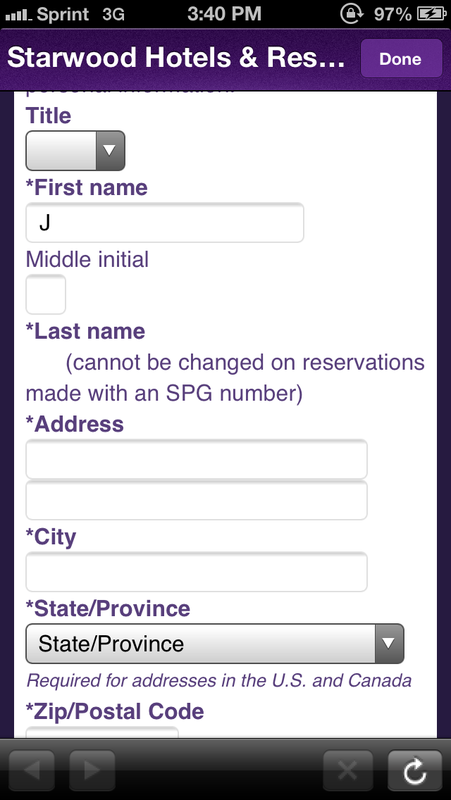 Your SPG number will be pre-populated and leave the StarChoice number blank. You can enter special requests under “Optional Information”. 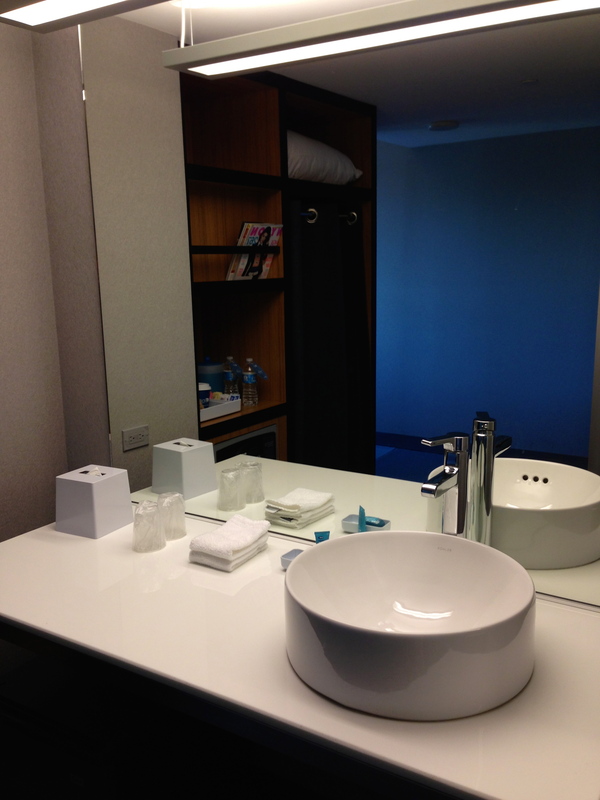 I always like to enter “SPG Platinum Guest- Please upgrade to the best suite available. Thanks”. You can also change your time of arrival in this area if you wish. You will see that your entered information will be highlighted in yellow. If you didn’t make any errors entering any of your personal information, then scroll all the way to the bottom and click “Complete Changes Now” . The next screen will say “Changes Complete” Your reservation has been changed. What this means is that you have added additional information to the reservation just as if you had handed over your credit card and passport/ID to the clerk. You will not be charged any additional fees on the credit card you have provided. Now, go back to your spg.com profile and you will be able to click on “Send Confirmation” You will now be able to receive an e-mail copy of your third party reservation. Refresh your screen and you will now be able to see all you reservation details including applying Suite Award NIghts (if applicable). Note- I was able to apply a suite award night, but the hotel was completely sold out and the automated suite night award system returned it back to my account a day before check-in since there were no suites available for an upgrade. There is a glitch in the spg.com system where you can receive a stay/night credit, but don’t hold your breath because the system will only award you Starpoints for incidentals. 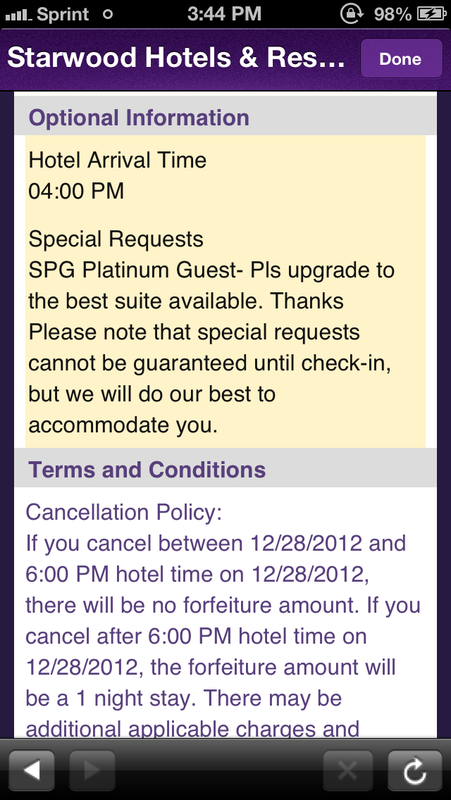 Also, when you check-in, do not ask for the 500 point Platinum amenity since spg.com won’t credit you. In this case, I would ask for a breakfast voucher or the local amenity. In some cases, the front desk agent can deny you of your Platinum benefits if they mention that you booked through a third party. Don’t argue with the clerk and accept the reality that hotel can’t offer you your Platinum benefits under a third party. I always add some kind of incidental charge on my third party stays since it can trigger a stay/night credit (sometimes you get lucky). 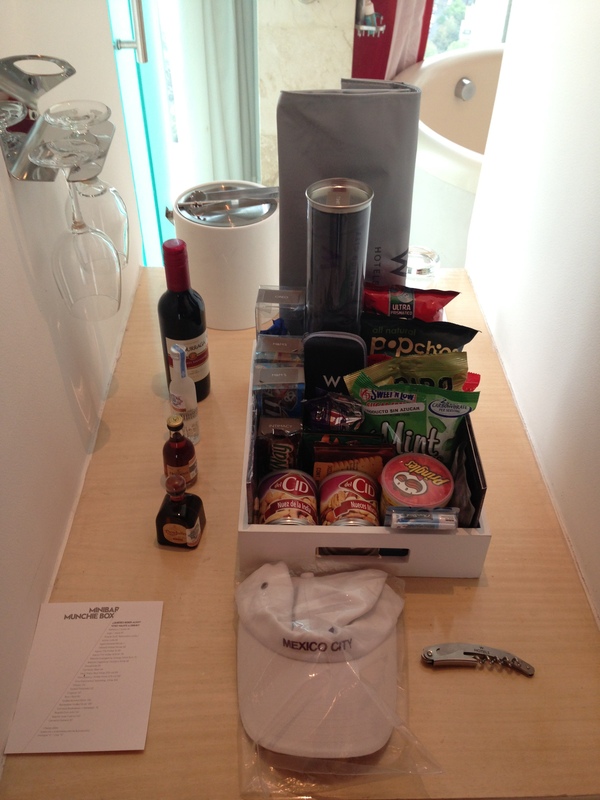 In many cases, I would add a minibar charge or lunch/dinner. For free Platinum internet, I would add the internet charge to your hotel room and kindly ask at checkout if it could be removed. I usually telephone in the morning after if they can remove the charge since they can see you are a Platinum member (make sure you don’t get the same agent). Remember, different agents = different responses. Happy booking! 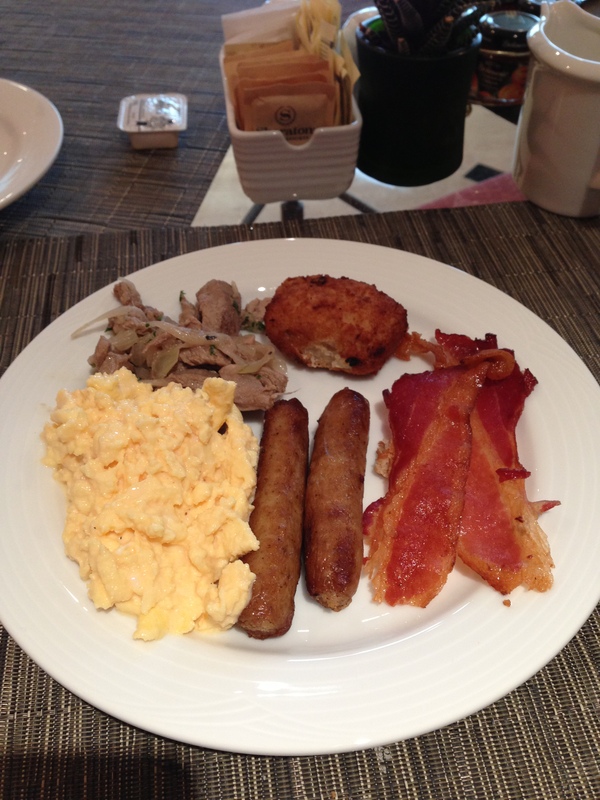 This entry was posted in starwood and tagged spg, starwood, tips, tricks on January 21, 2013 by jammanxc.